Scuola Secondaria di I Grado “Don Giovanni Minzoni “ San Pietro Vernotico (BR) ITALY Progetto Comenius: ”Culture Box” 2010/2011. 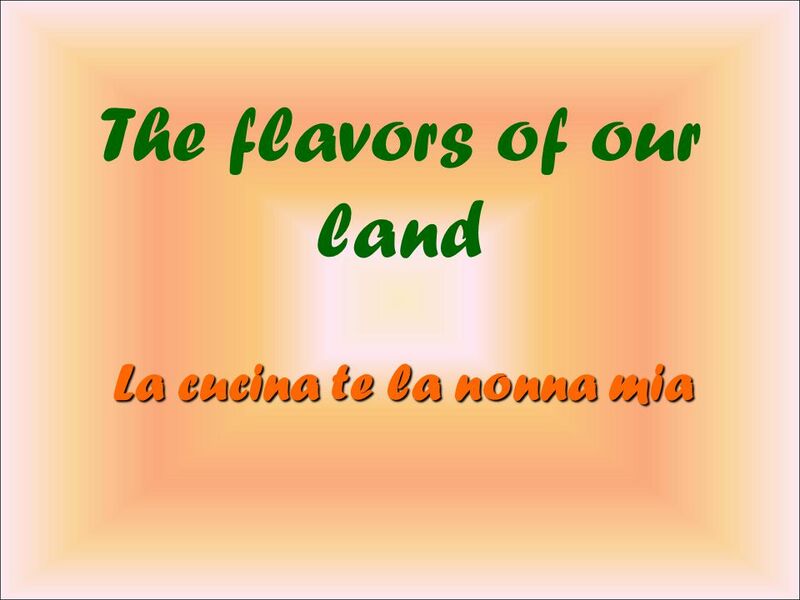 5 Italy has a rich and varied culinary tradition, unique in the world. 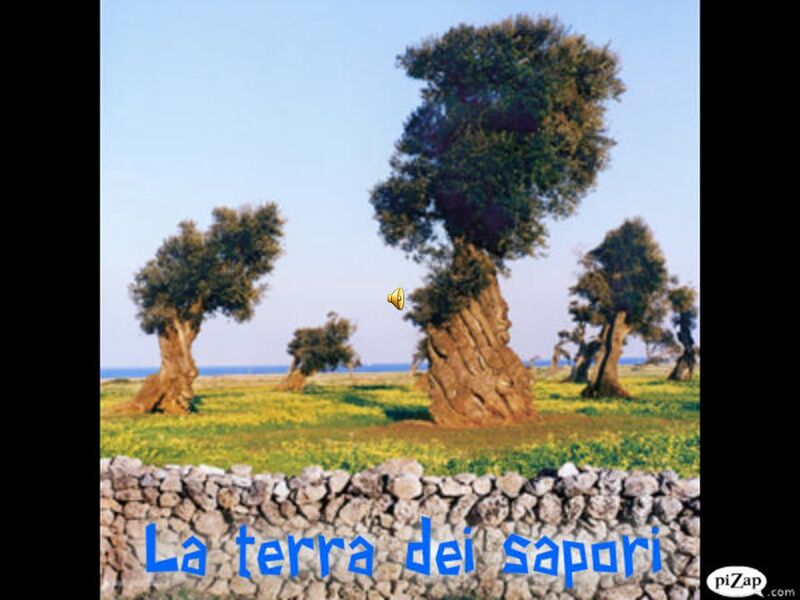 Its climate, history and the diverse range of customs and traditions that characterize each regions have created in our nation exceptional "greedy deposits", in Apulia and Salento. Our products are a reflection of our territory, ancient gestures, rituals drawn from the peasant culture, resources that our parents have bequeathed to their children with intelligence and imagination. 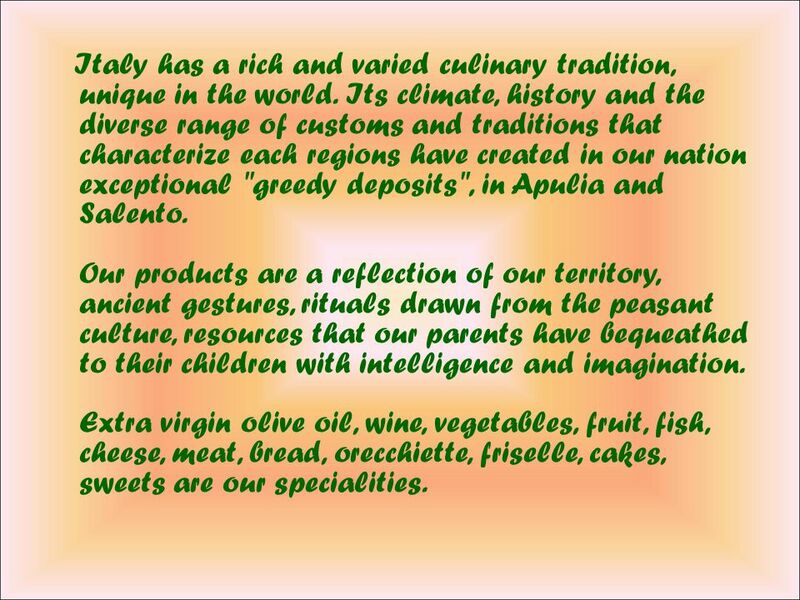 Extra virgin olive oil, wine, vegetables, fruit, fish, cheese, meat, bread, orecchiette, friselle, cakes, sweets are our specialities. 6 However, today there is an abandonment of the Mediterranean diet and cultural traditions from teenagers who are turning increasingly to the so-called "junkfood junk food, like potato chips, sandwiches, snacks and cakes. This unhealth, food is also a danger to the culinary traditions and a loss of values and experiences of traditional food. We must recover our local food culture that will enable the students to reflect on the social relations between past and present, to project back in time with their imagination, having eyes on the future. 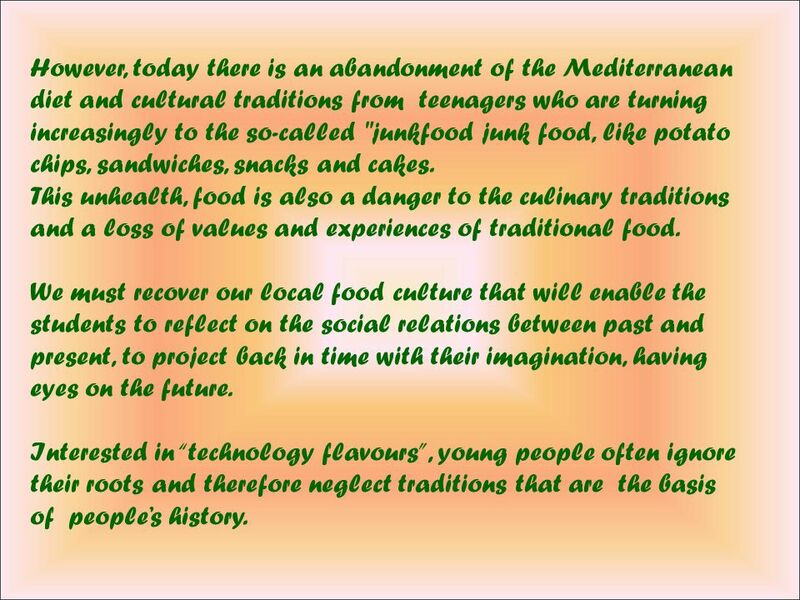 Interested in “technology flavours”, young people often ignore their roots and therefore neglect traditions that are the basis of people’s history. 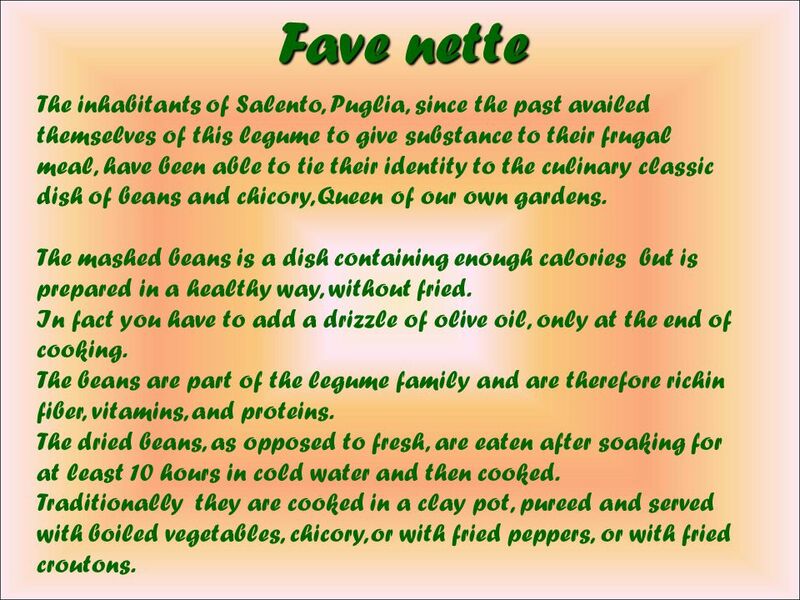 8 Fave nette The inhabitants of Salento, Puglia, since the past availed themselves of this legume to give substance to their frugal meal, have been able to tie their identity to the culinary classic dish of beans and chicory, Queen of our own gardens. 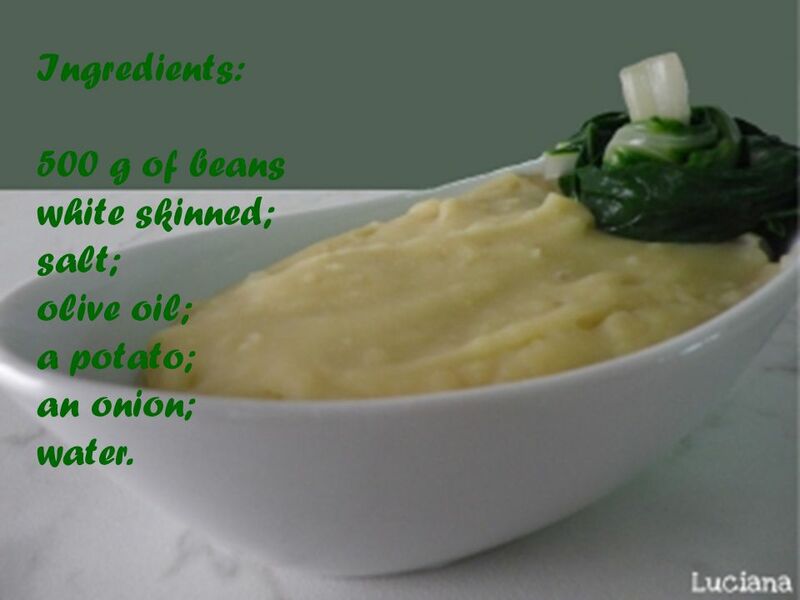 The mashed beans is a dish containing enough calories but is prepared in a healthy way, without fried. 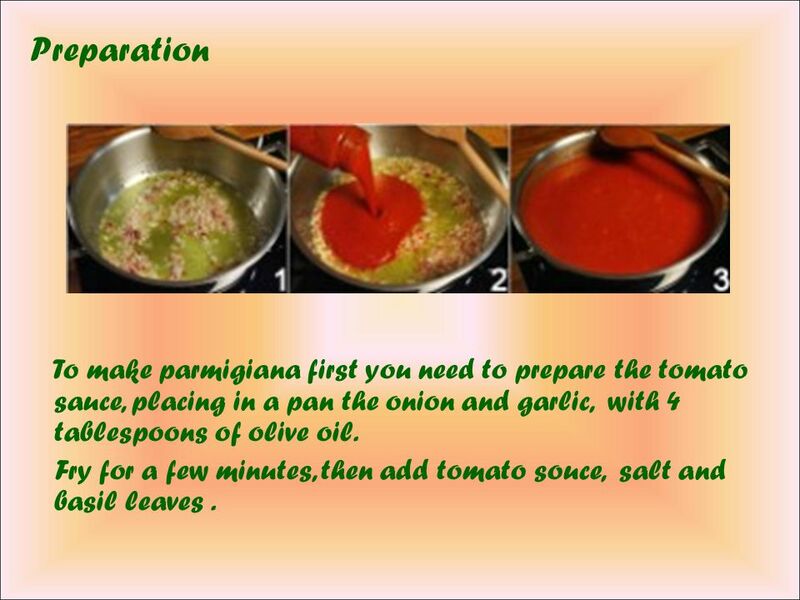 In fact you have to add a drizzle of olive oil, only at the end of cooking. The beans are part of the legume family and are therefore richin fiber, vitamins, and proteins. 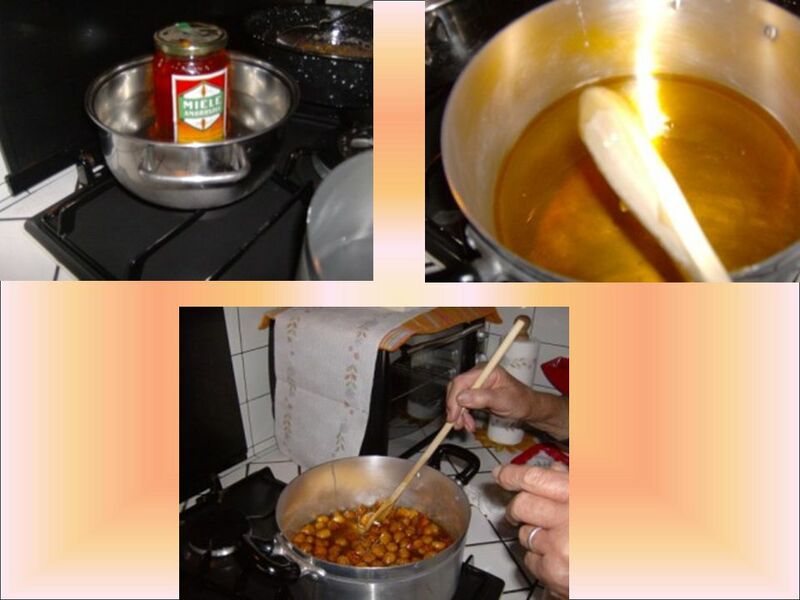 The dried beans, as opposed to fresh, are eaten after soaking for at least 10 hours in cold water and then cooked. 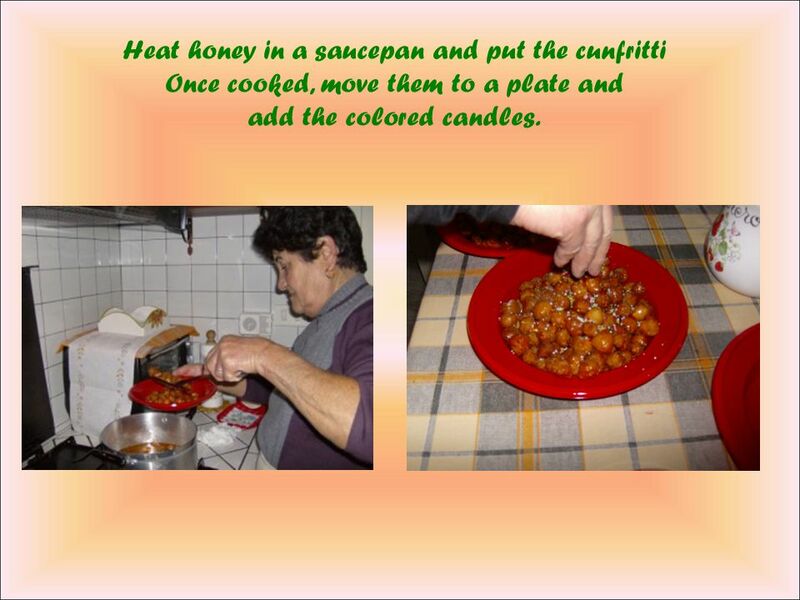 Traditionally they are cooked in a clay pot, pureed and served with boiled vegetables, chicory, or with fried peppers, or with fried croutons. 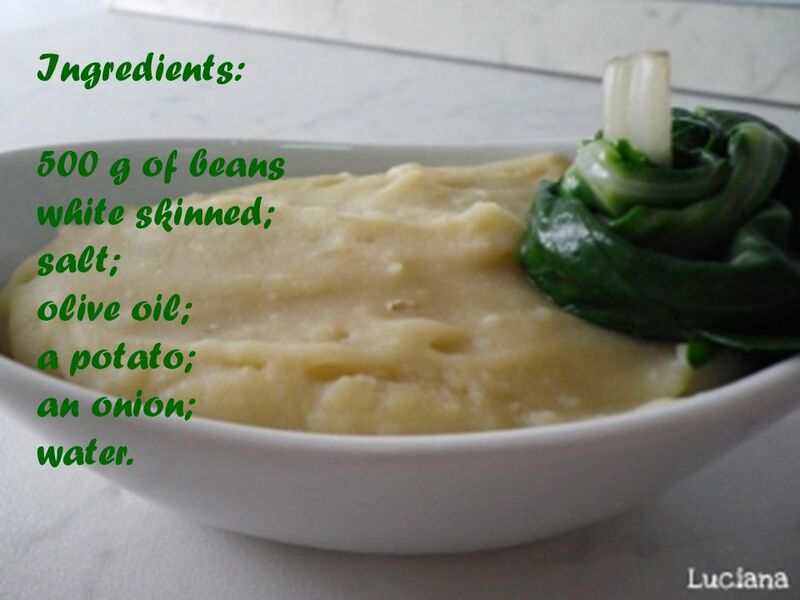 9 Ingredients: 500 g of beans white skinned; salt; olive oil; a potato; an onion; water. 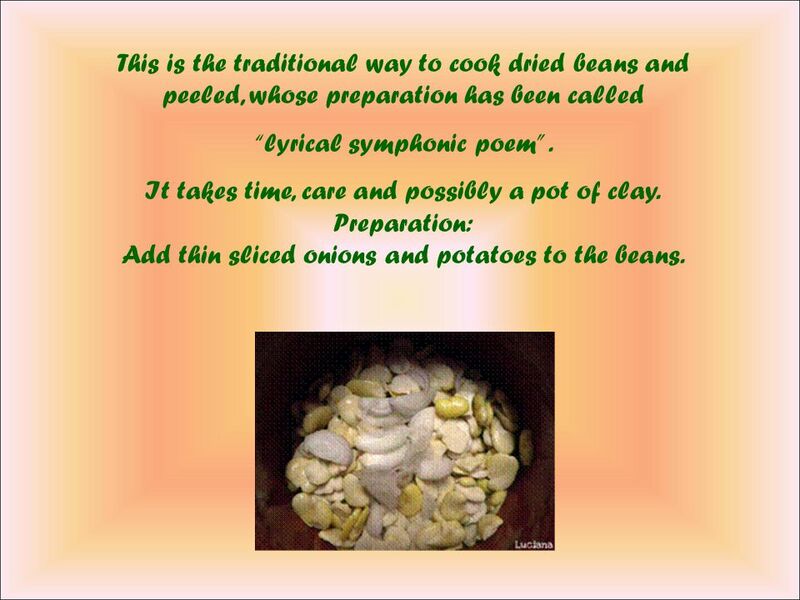 10 This is the traditional way to cook dried beans and peeled, whose preparation has been called “lyrical symphonic poem”. It takes time, care and possibly a pot of clay. 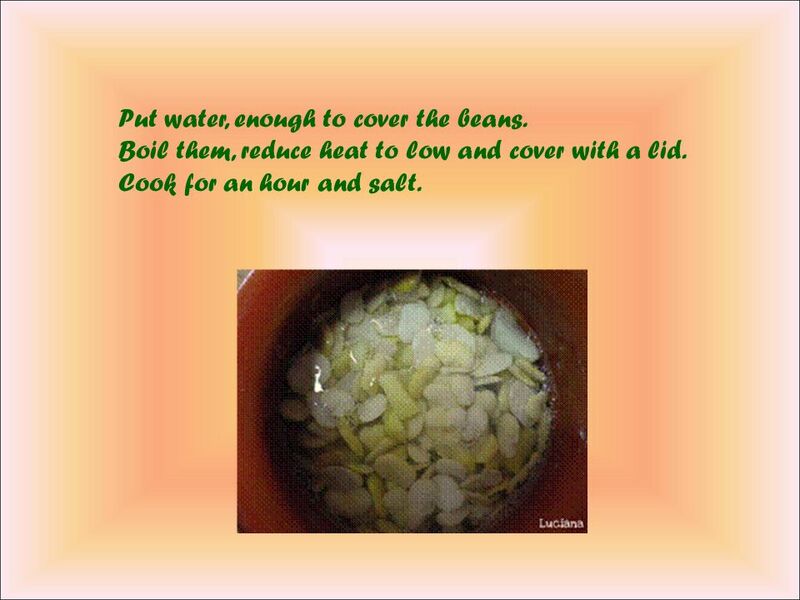 Preparation: Add thin sliced onions and potatoes to the beans. 11 Put water, enough to cover the beans. Boil them, reduce heat to low and cover with a lid. Cook for an hour and salt. 12 Continue cooking for another hour, again at low heat. Stir, with the decision, in pot with a wooden spoon to prevent them from sticking to the bottom, until they are a thick cream. 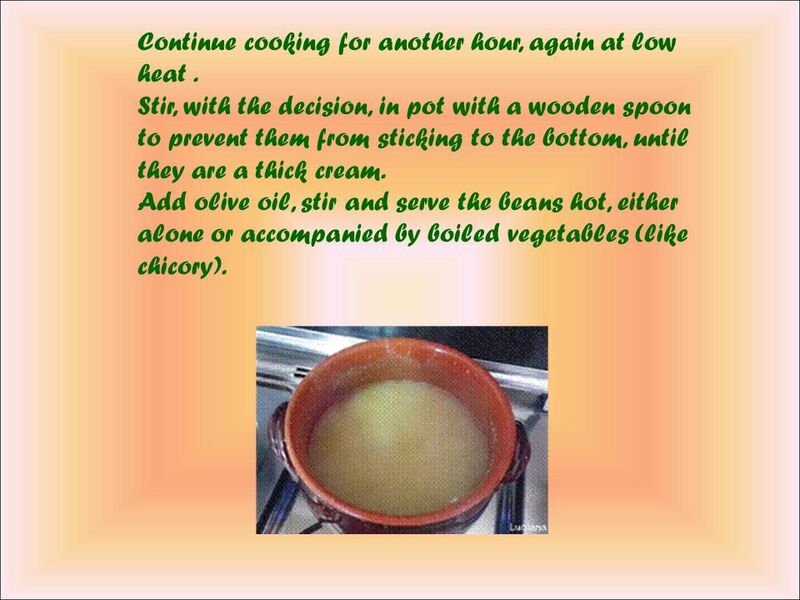 Add olive oil, stir and serve the beans hot, either alone or accompanied by boiled vegetables (like chicory). 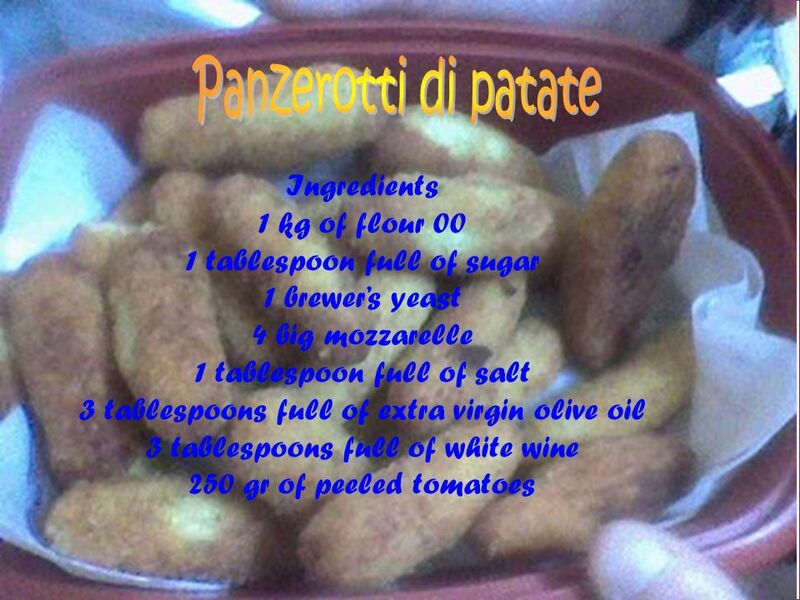 13 Ingredients: 500 g of beans white skinned; salt; olive oil; a potato; an onion; water. 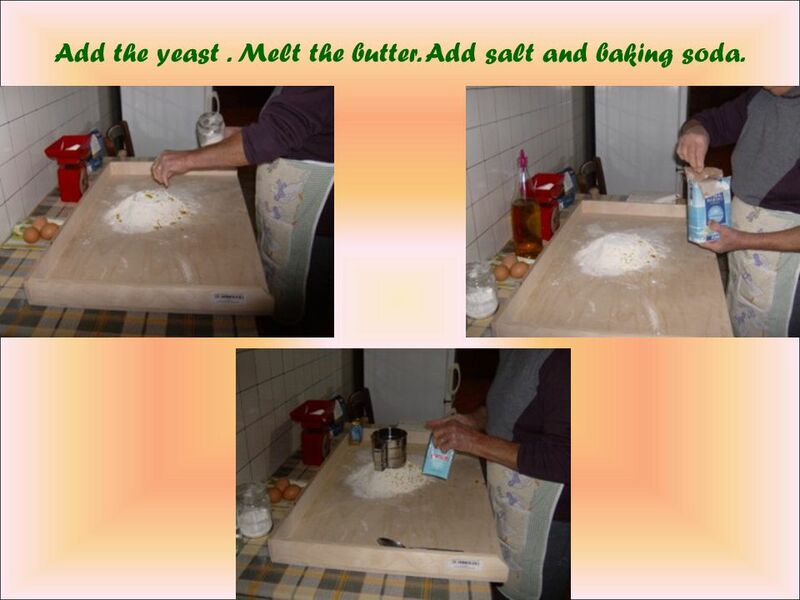 15 Combine the semolina, unbleached flour and salt, and mound it on a large work surface. 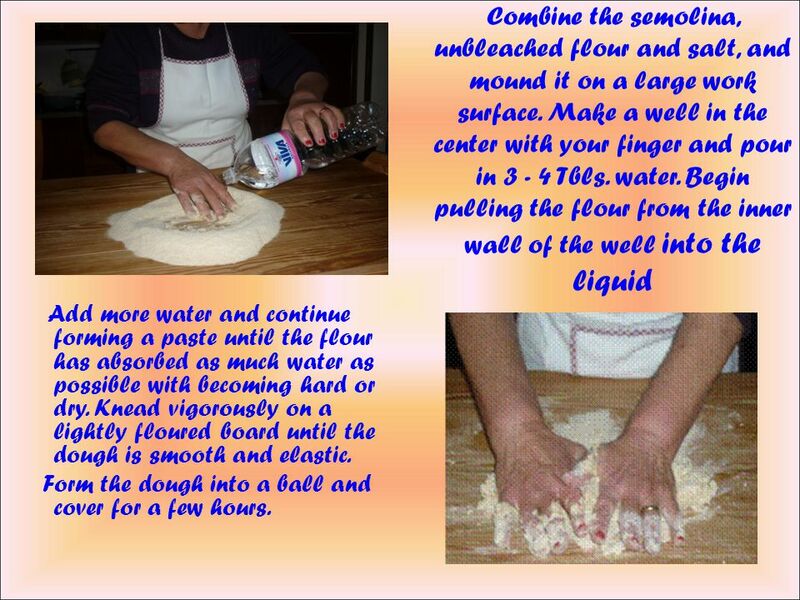 Make a well in the center with your finger and pour in 3 - 4 Tbls. water. 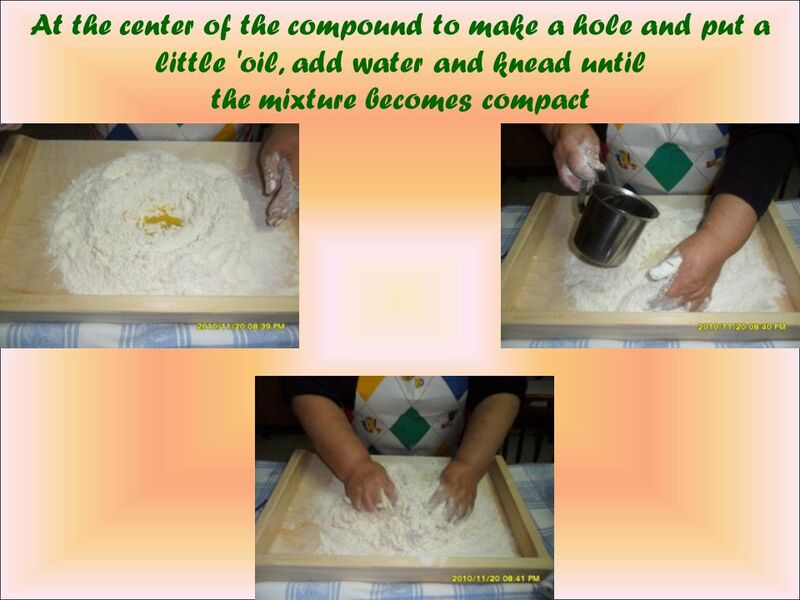 Begin pulling the flour from the inner wall of the well into the liquid Add more water and continue forming a paste until the flour has absorbed as much water as possible with becoming hard or dry. 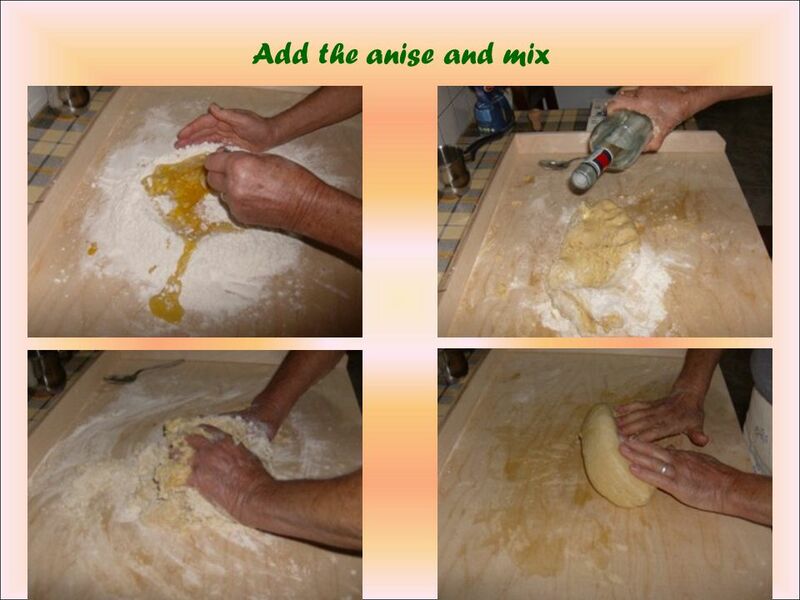 Knead vigorously on a lightly floured board until the dough is smooth and elastic. 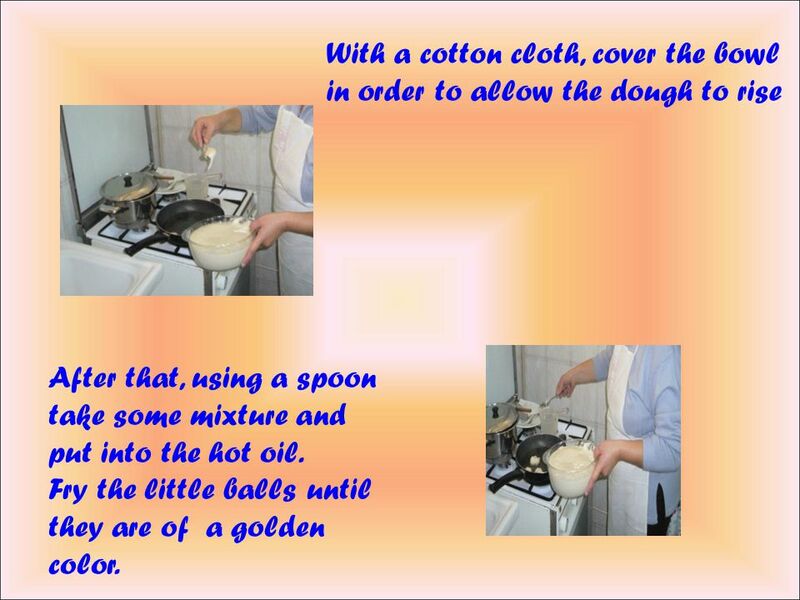 Form the dough into a ball and cover for a few hours. 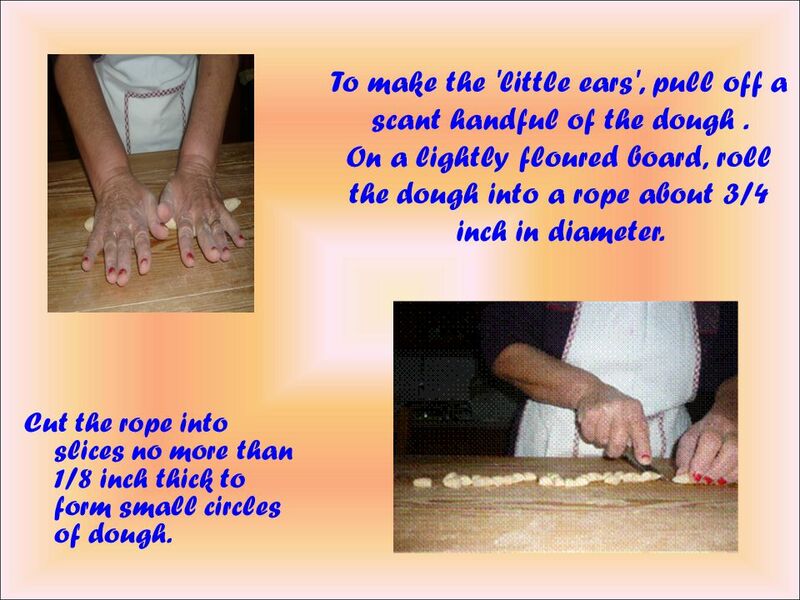 16 To make the 'little ears', pull off a scant handful of the dough. 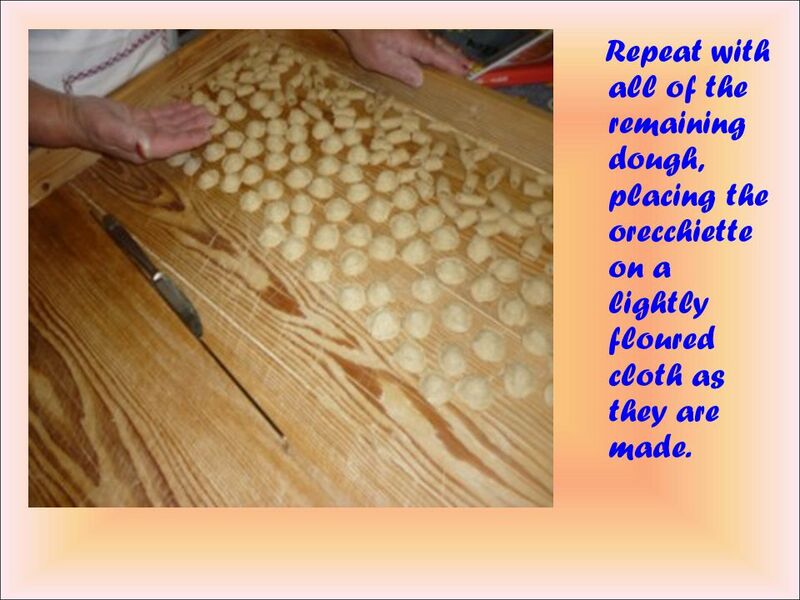 On a lightly floured board, roll the dough into a rope about 3/4 inch in diameter. 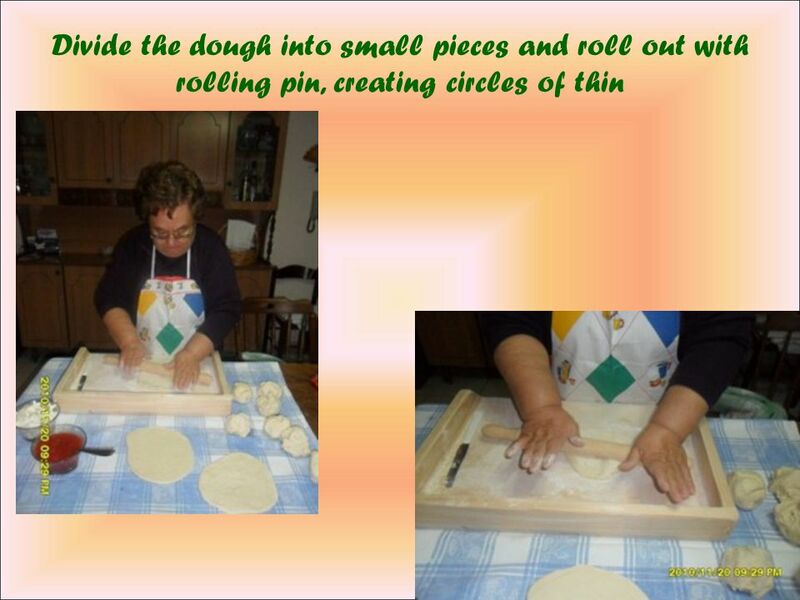 Cut the rope into slices no more than 1/8 inch thick to form small circles of dough. 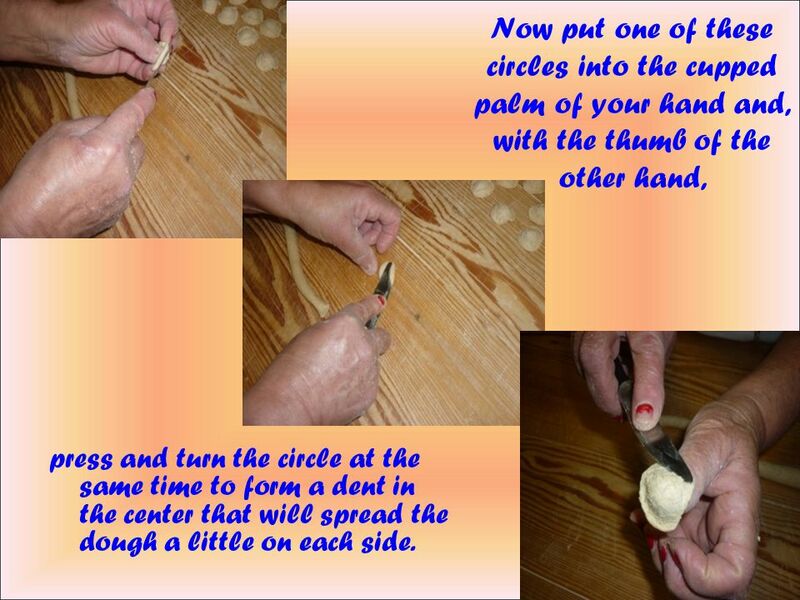 17 Now put one of these circles into the cupped palm of your hand and, with the thumb of the other hand, press and turn the circle at the same time to form a dent in the center that will spread the dough a little on each side. 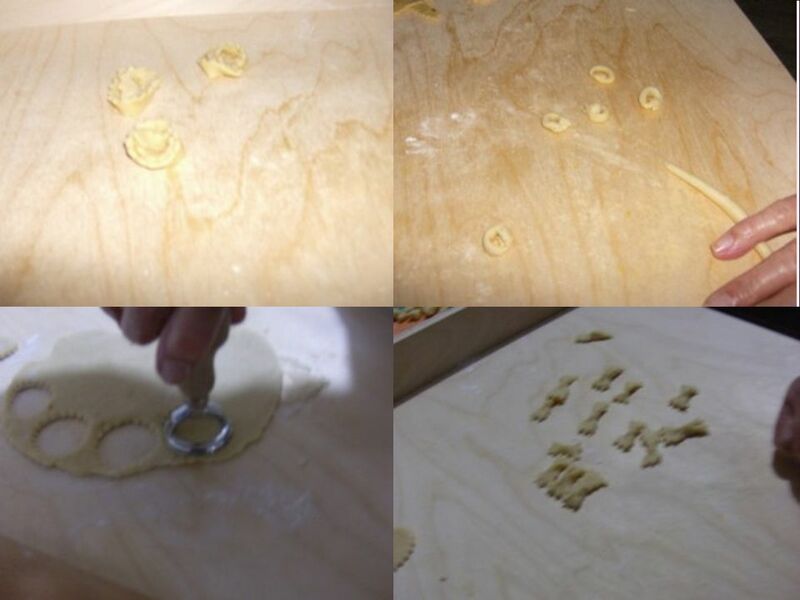 18 Repeat with all of the remaining dough, placing the orecchiette on a lightly floured cloth as they are made. 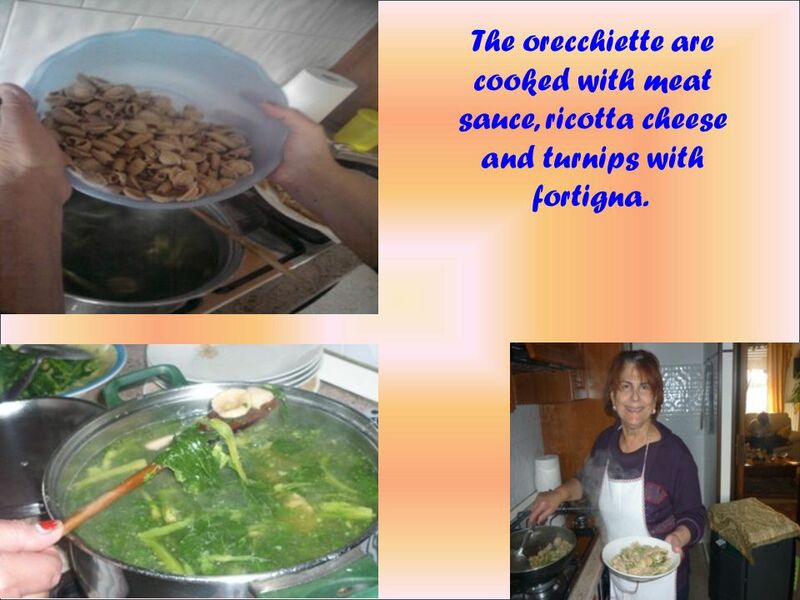 19 The orecchiette are cooked with meat sauce, ricotta cheese and turnips with fortigna. 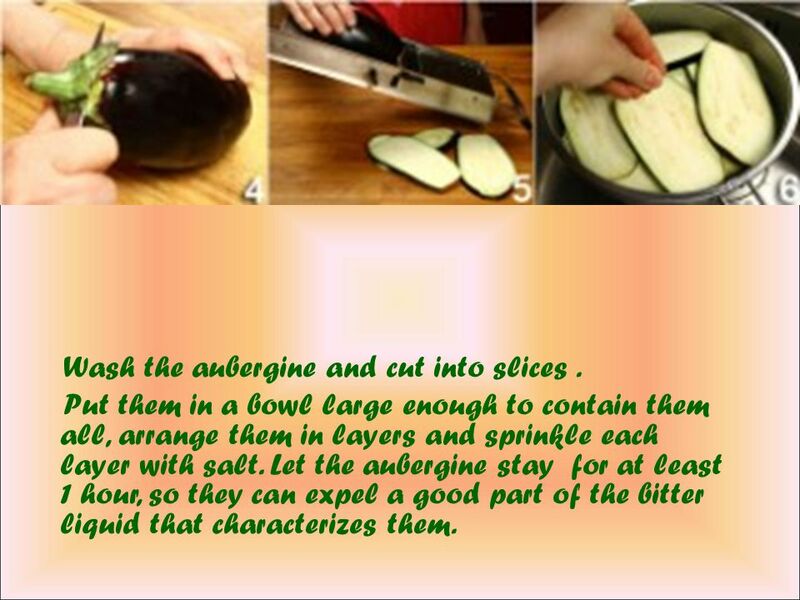 22 Wash the aubergine and cut into slices. Put them in a bowl large enough to contain them all, arrange them in layers and sprinkle each layer with salt. Let the aubergine stay for at least 1 hour, so they can expel a good part of the bitter liquid that characterizes them. 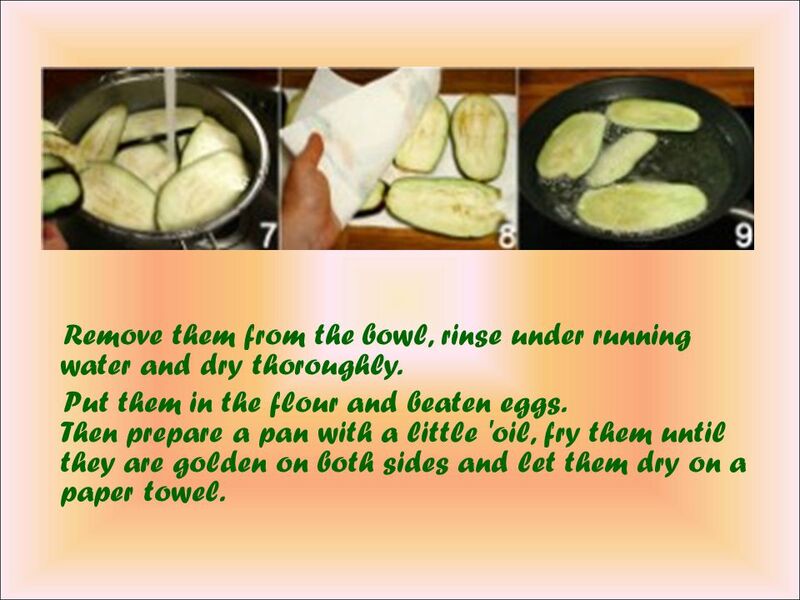 23 Remove them from the bowl, rinse under running water and dry thoroughly. 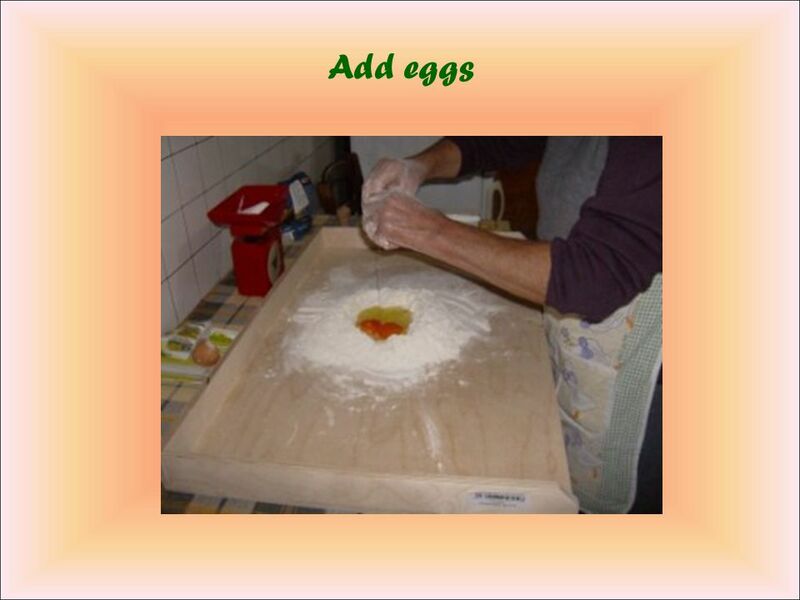 Put them in the flour and beaten eggs. 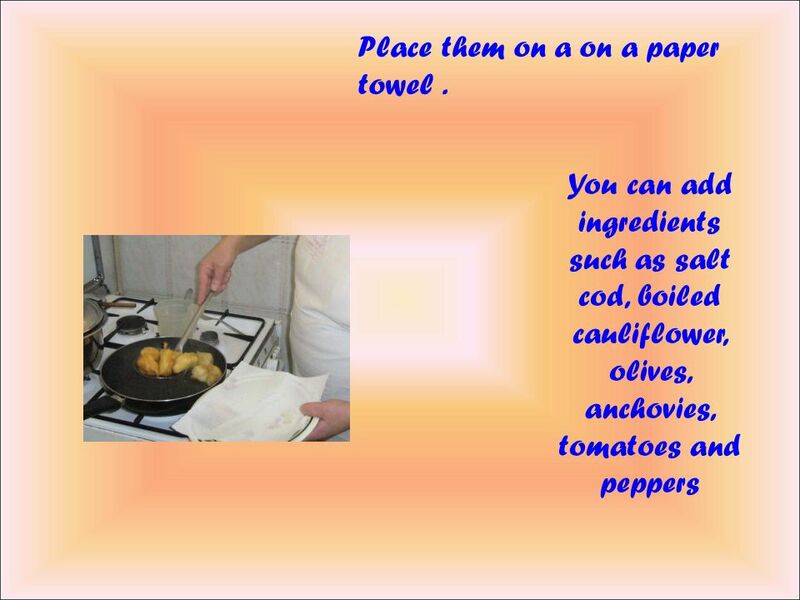 Then prepare a pan with a little 'oil, fry them until they are golden on both sides and let them dry on a paper towel. 24 Grease a baking dish, sprinkle the bottom with a little sauce and have a first layer of aubergines b placed side by side without overlapping. 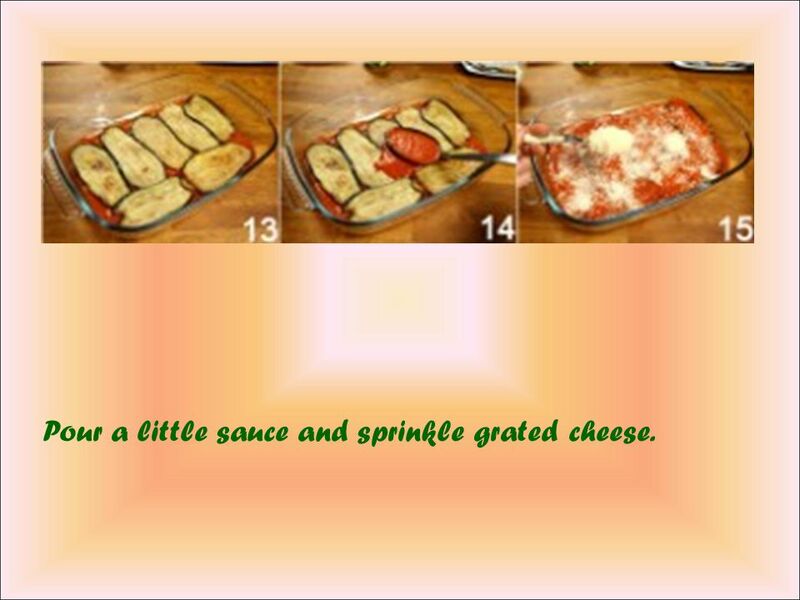 25 Pour a little sauce and sprinkle grated cheese. 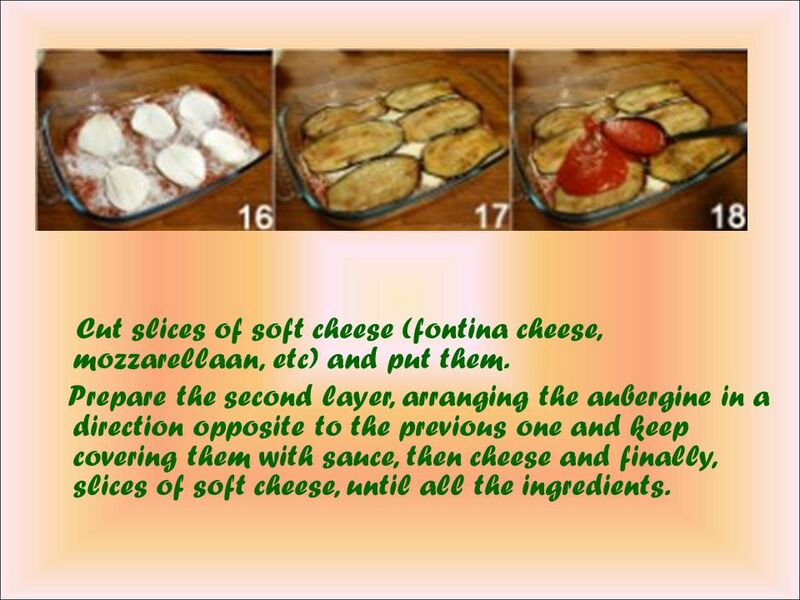 26 Cut slices of soft cheese (fontina cheese, mozzarellaan, etc) and put them. 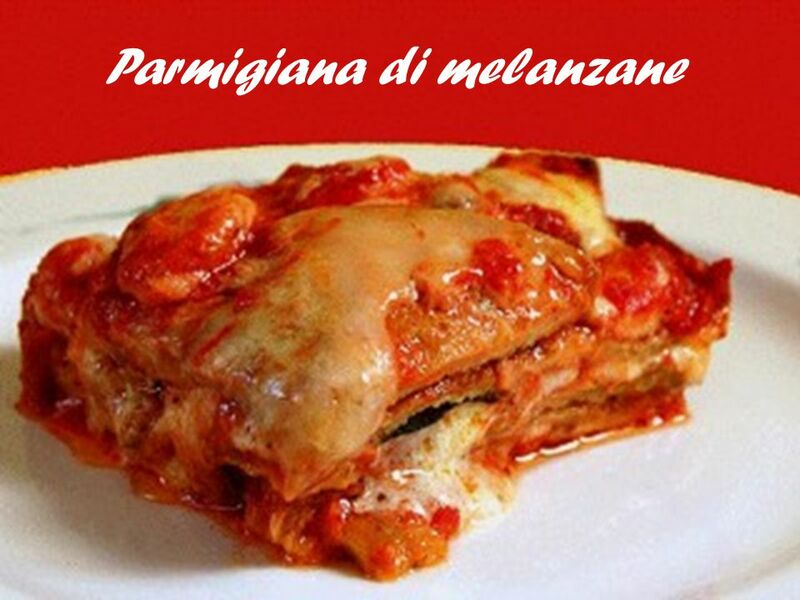 Prepare the second layer, arranging the aubergine in a direction opposite to the previous one and keep covering them with sauce, then cheese and finally, slices of soft cheese, until all the ingredients. 27 Finally put tomato souce and grated cheese. 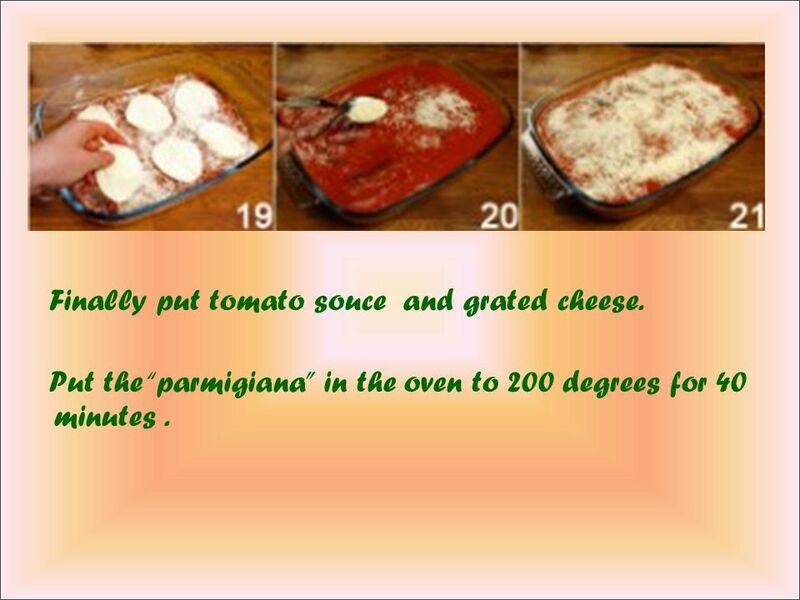 Put the “parmigiana” in the oven to 200 degrees for 40 minutes. 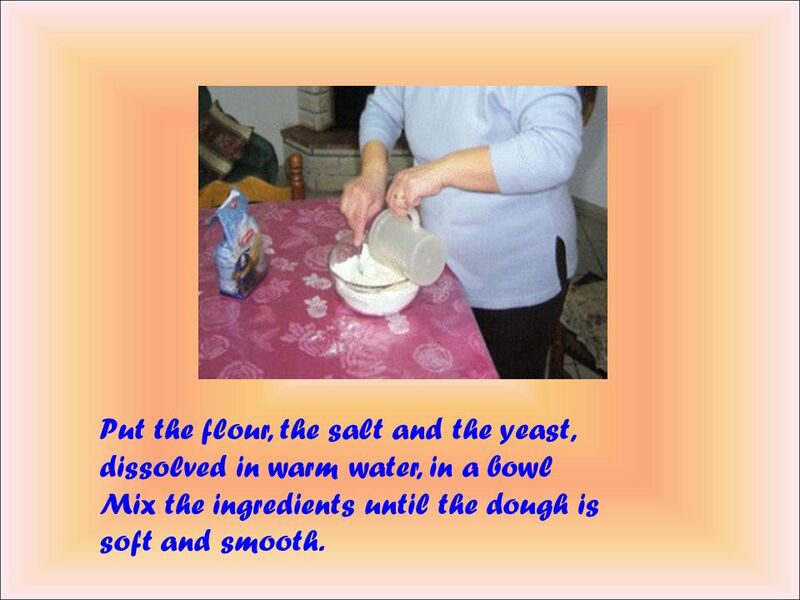 29 Put the flour, the salt and the yeast, dissolved in warm water, in a bowl Mix the ingredients until the dough is soft and smooth. 30 Stir the mixture until it begins to swell. 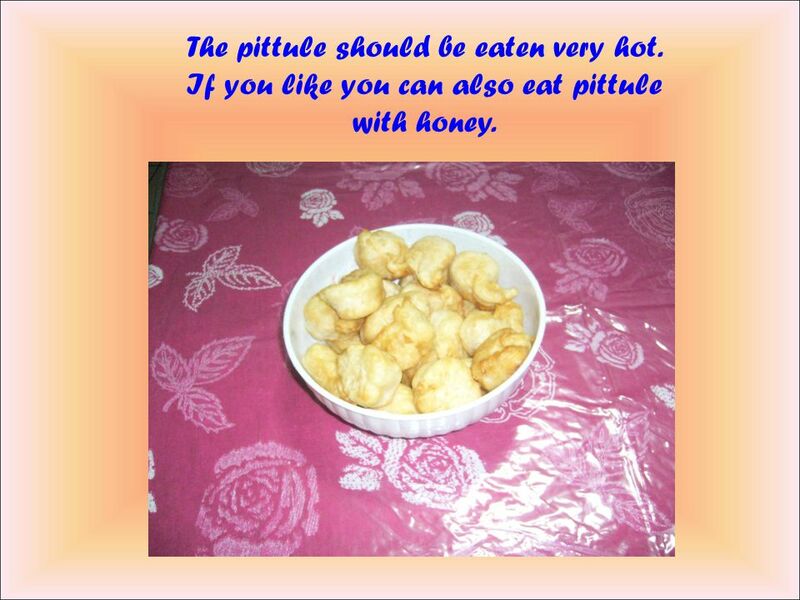 33 The pittule should be eaten very hot. 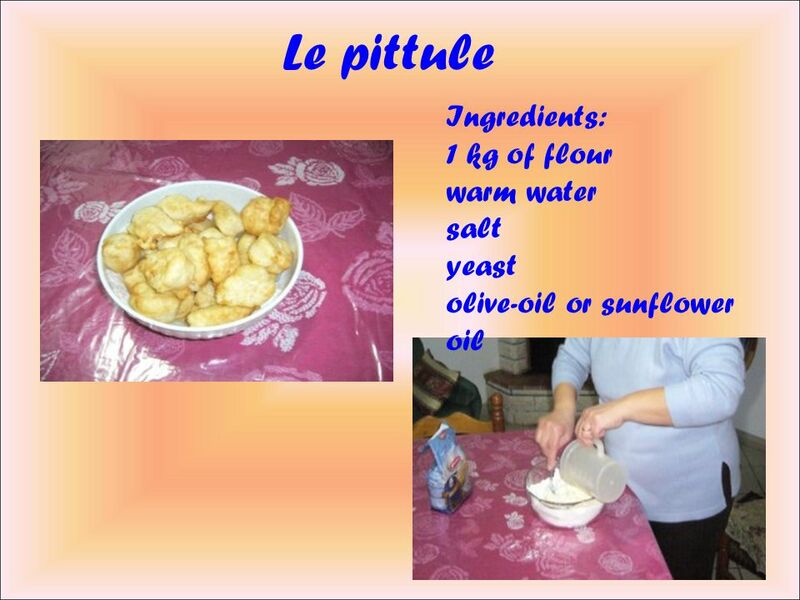 If you like you can also eat pittule with honey. 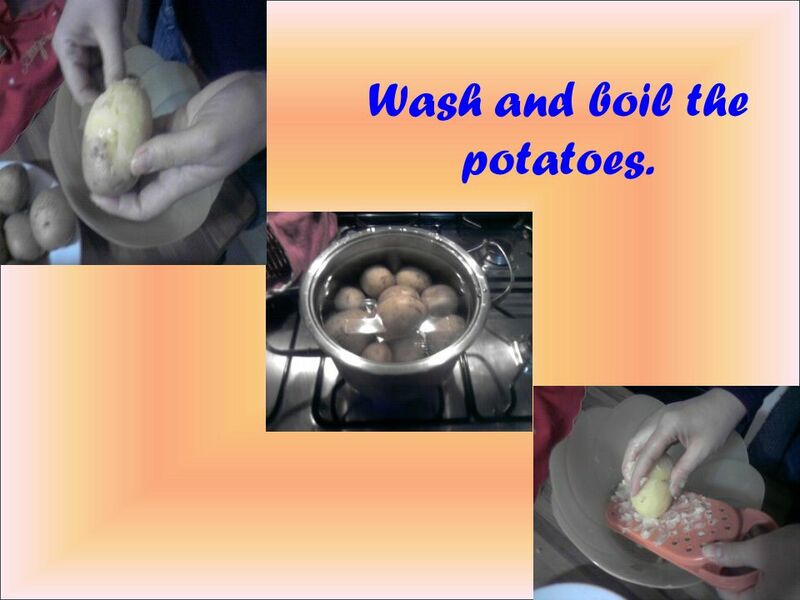 35 Wash and boil the potatoes. 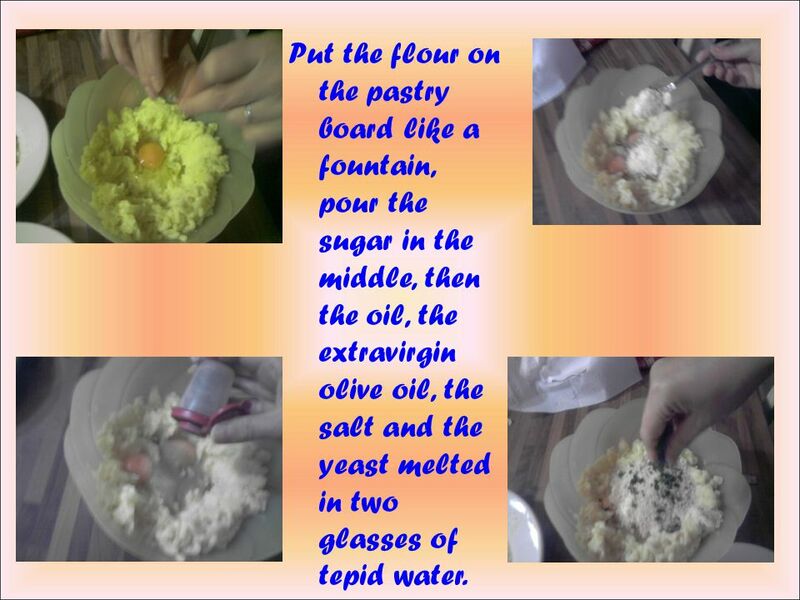 36 Put the flour on the pastry board like a fountain, pour the sugar in the middle, then the oil, the extravirgin olive oil, the salt and the yeast melted in two glasses of tepid water. 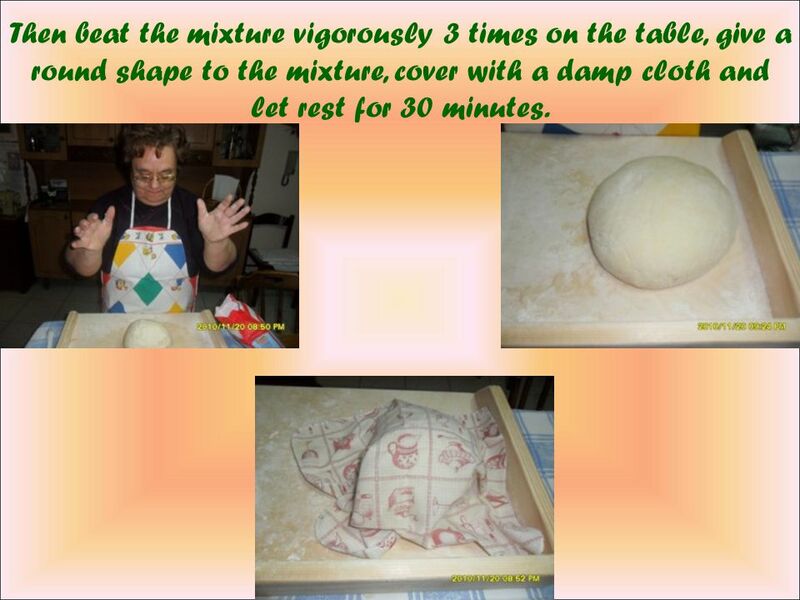 37 Mix well and add some tepid water till you obtain a very soft and elastic dough. Make a block,, cover it with a cloth and let it rising (in a hot place): half an hour will be enough When the rising has finished, take the block, work it one more time and get from it some balls, big as an orange. 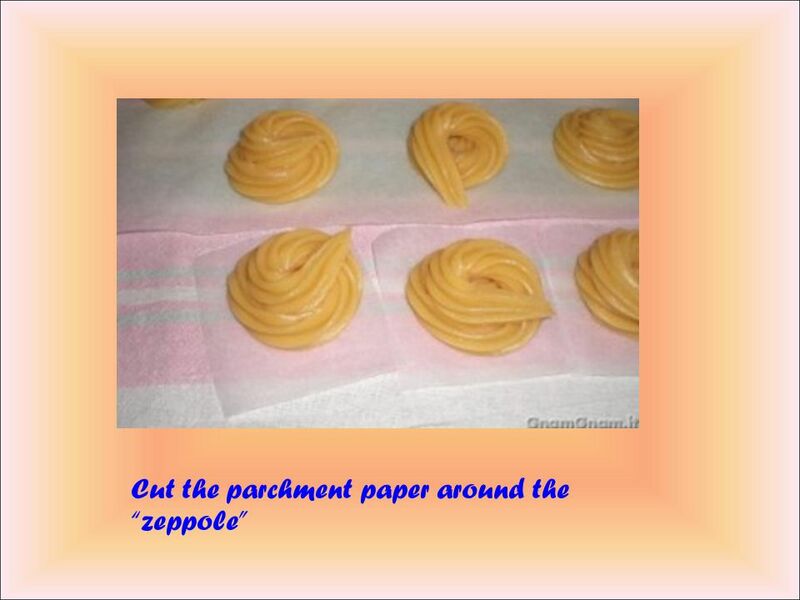 Cover them again with a wet cloth and let them rising for half an hour. Now get from the small balls some disks of 15 centimetres of diameter. 38 Close it with the empty half and you will obtain a half moon. Take care of closing well around the edges helping your self with a fork. 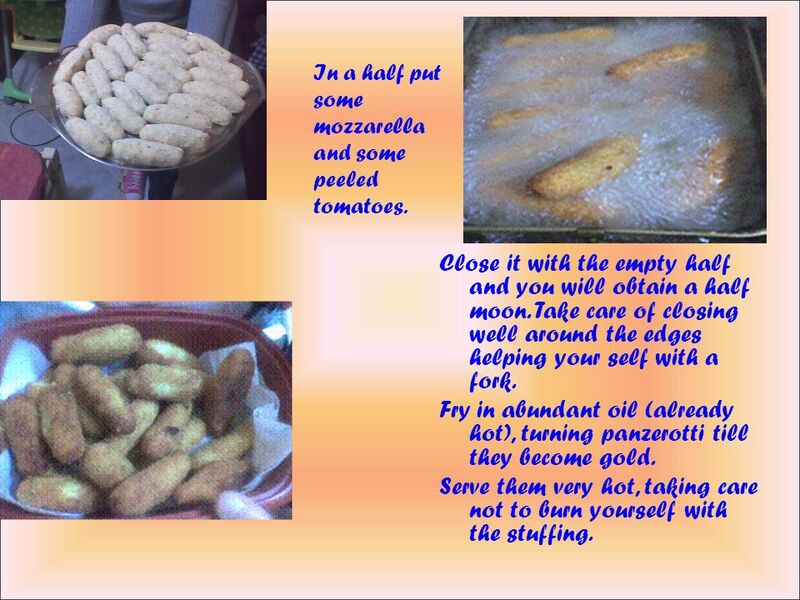 Fry in abundant oil (already hot), turning panzerotti till they become gold. Serve them very hot, taking care not to burn yourself with the stuffing. In a half put some mozzarella and some peeled tomatoes. 40 Wash and mince the giblets, then dress them with pecorino cheese, salt, pepper and parsley. 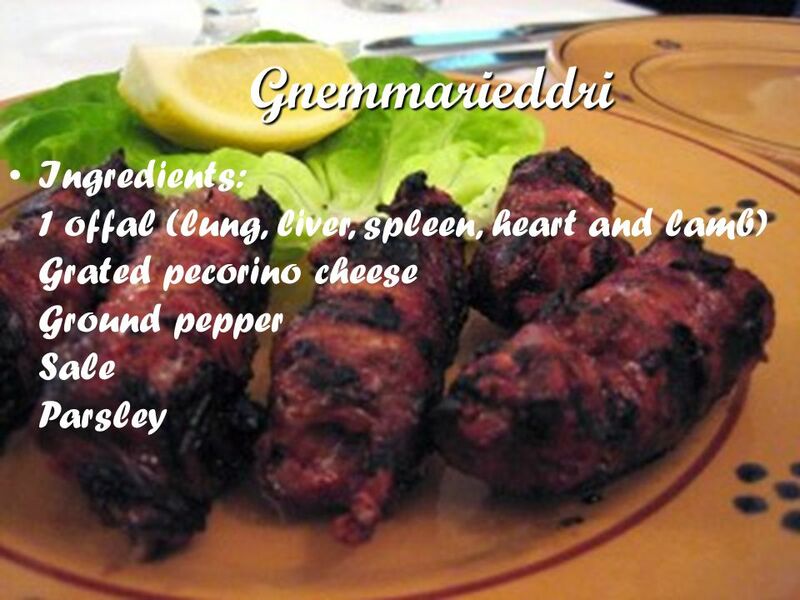 Roll them with the ingredients and wrap with the guts of a lamb. Stew or roast them. 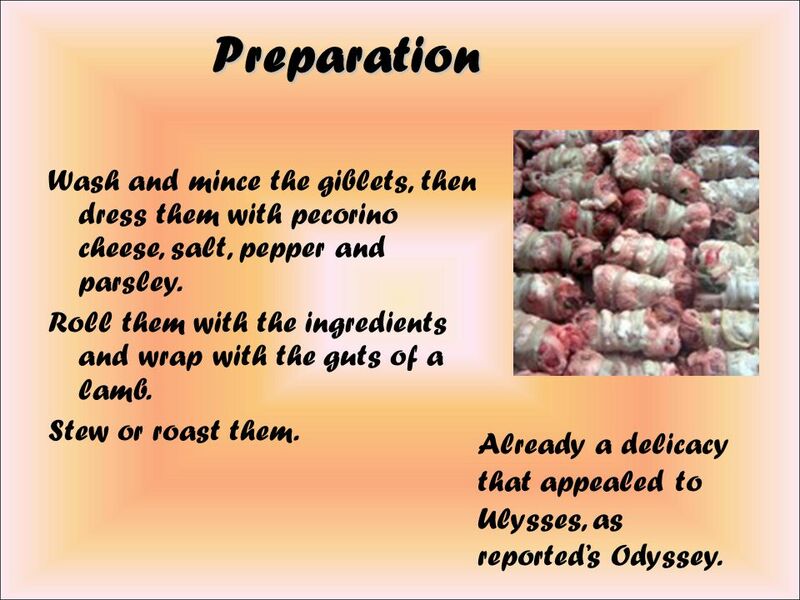 Preparation Preparation Already a delicacy that appealed to Ulysses, as reported’s Odyssey. 42 Preparation Pour the flour onto a pastry board and add the yeast, put the sugar and mix everything, then add the salt and continue mixing. 44 Then beat the mixture vigorously 3 times on the table, give a round shape to the mixture, cover with a damp cloth and let rest for 30 minutes. 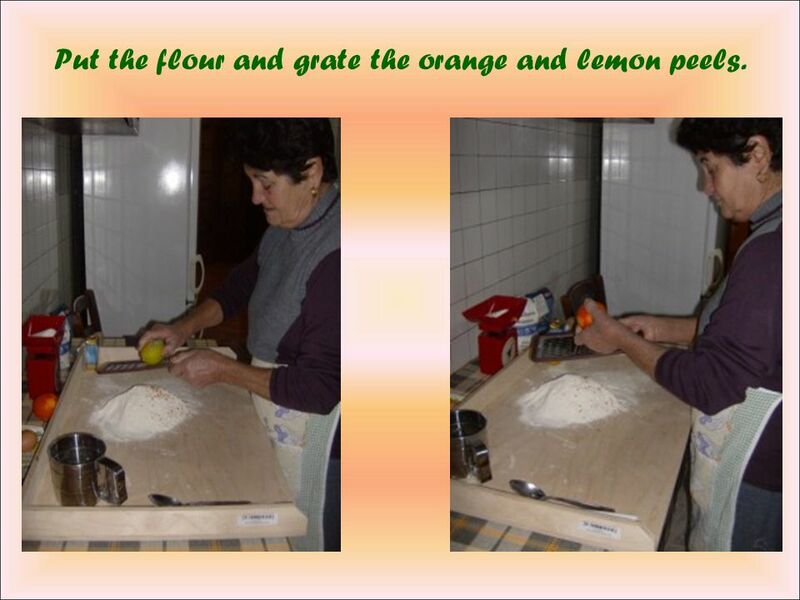 48 Put the flour and grate the orange and lemon peels. 49 Add the yeast. Melt the butter. Add salt and baking soda. 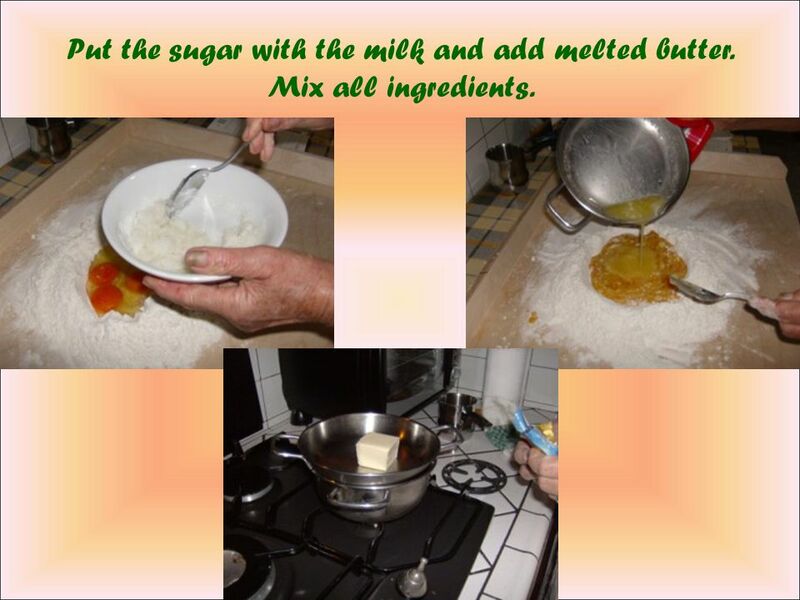 51 Put the sugar with the milk and add melted butter. Mix all ingredients. 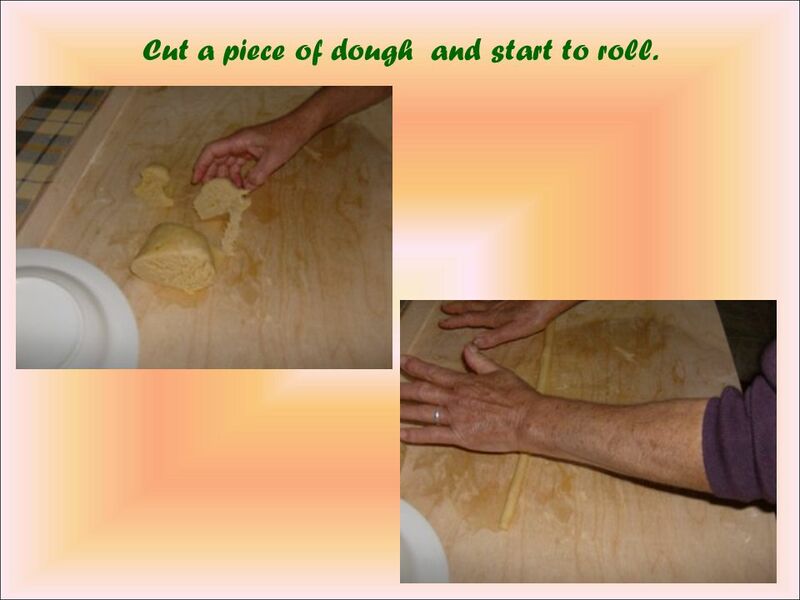 53 Cut a piece of dough and start to roll. 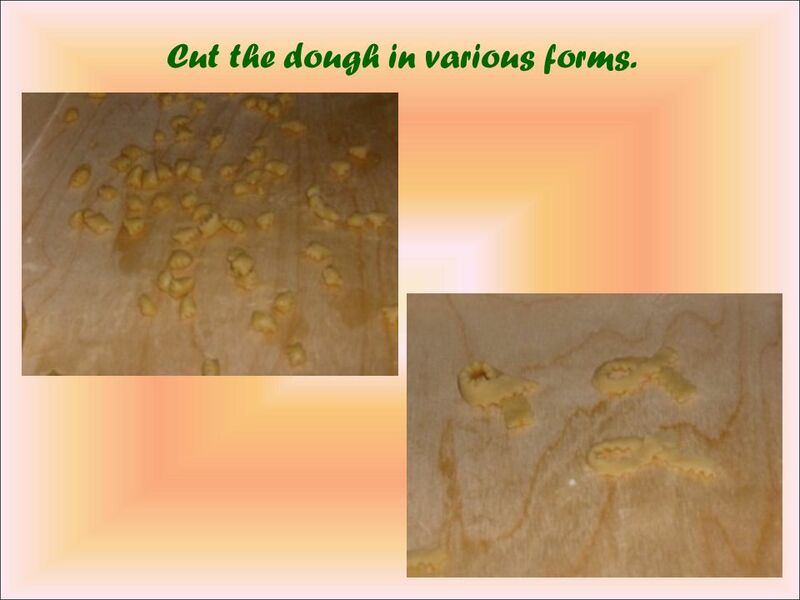 54 Cut the dough in various forms. 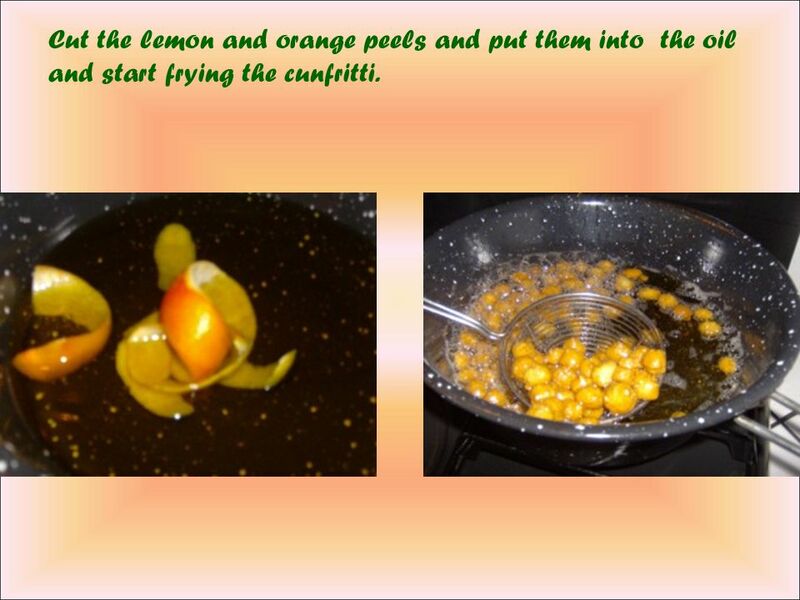 56 Cut the lemon and orange peels and put them into the oil and start frying the cunfritti. 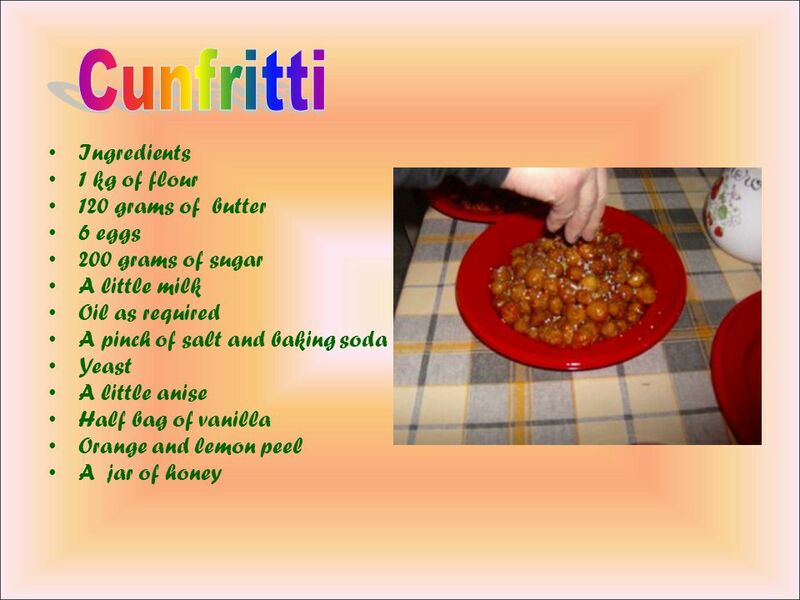 58 Heat honey in a saucepan and put the cunfritti Once cooked, move them to a plate and add the colored candles. 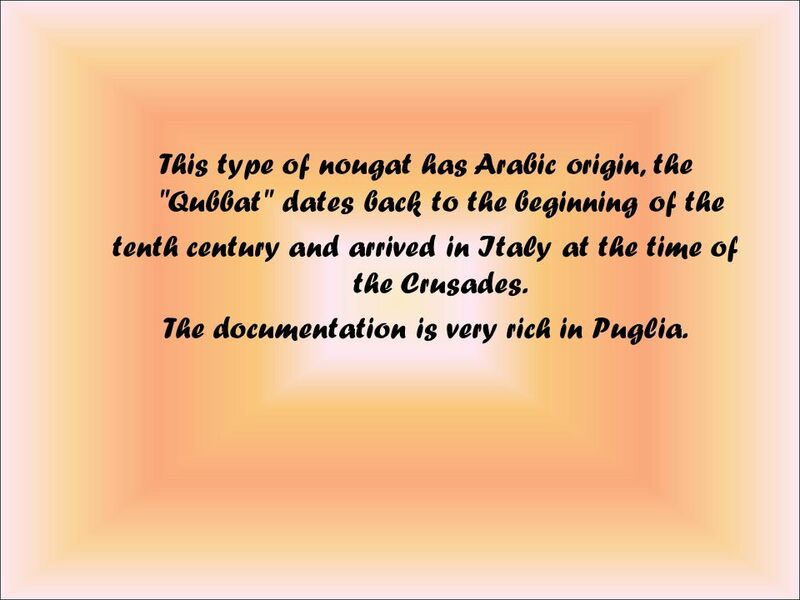 60 This type of nougat has Arabic origin, the "Qubbat" dates back to the beginning of the tenth century and arrived in Italy at the time of the Crusades. The documentation is very rich in Puglia. 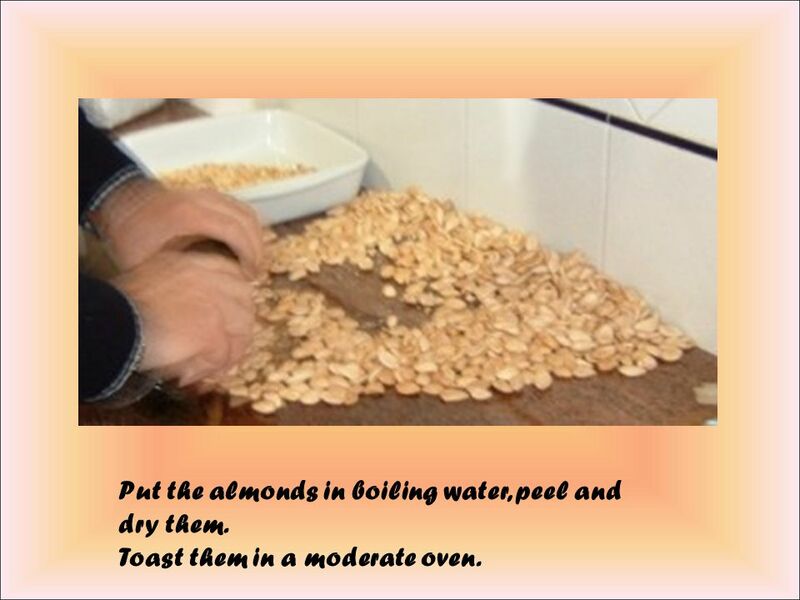 61 Put the almonds in boiling water, peel and dry them. Toast them in a moderate oven. 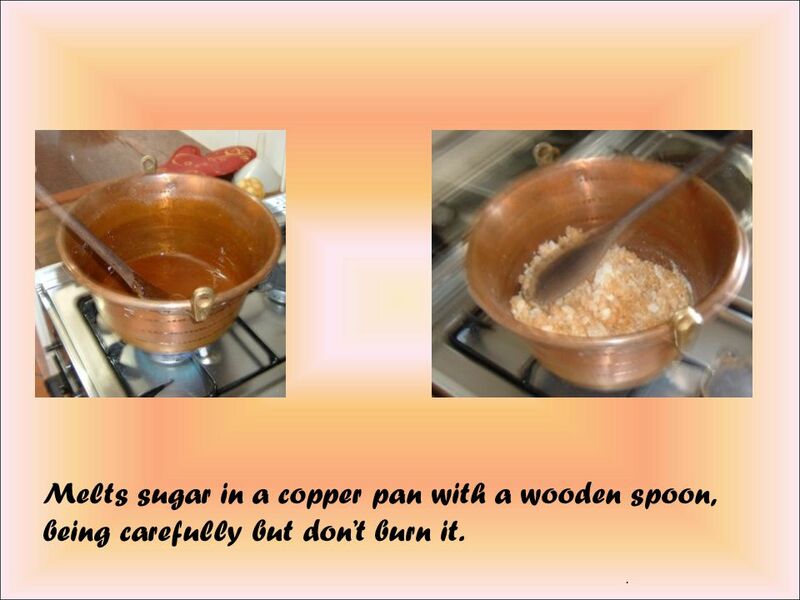 62 Melts sugar in a copper pan with a wooden spoon, being carefully but don’t burn it..
63 When sugar is melted, add the almonds, and stir vigorously for a few seconds on the fire. 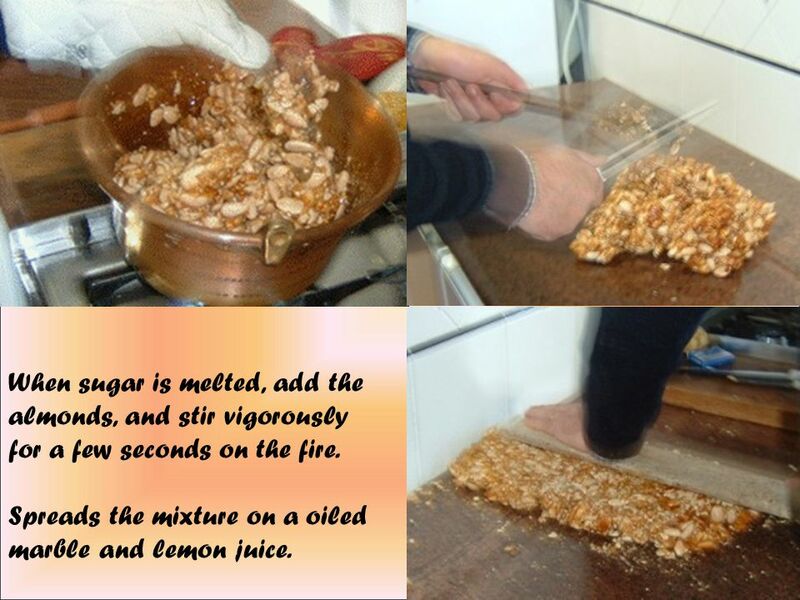 Spreads the mixture on a oiled marble and lemon juice. 64 Use a meat mallet to flatten it, or rather a whole lemon to flavor the crisp. 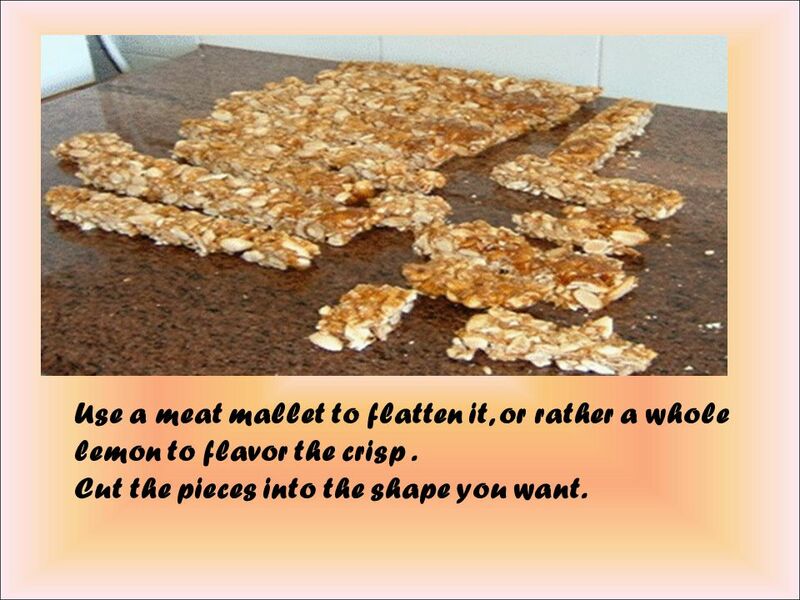 Cut the pieces into the shape you want. 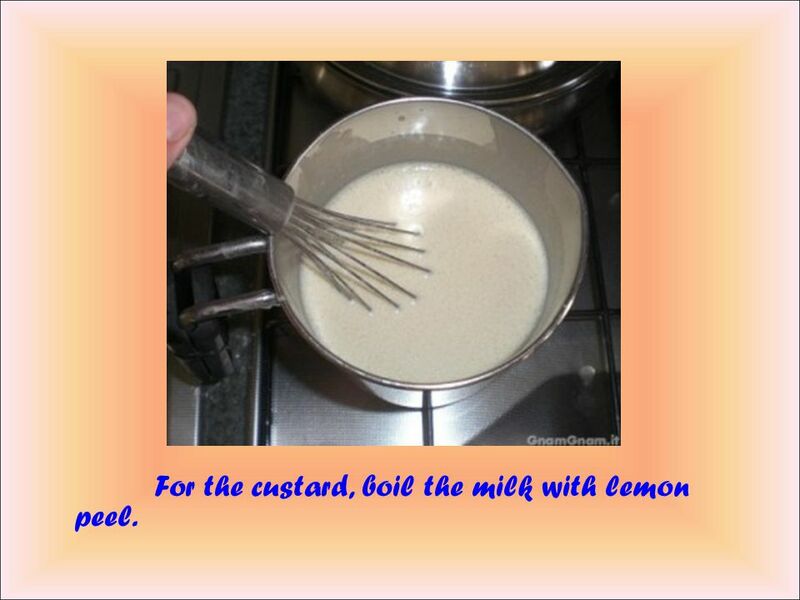 66 For the custard, boil the milk with lemon peel. 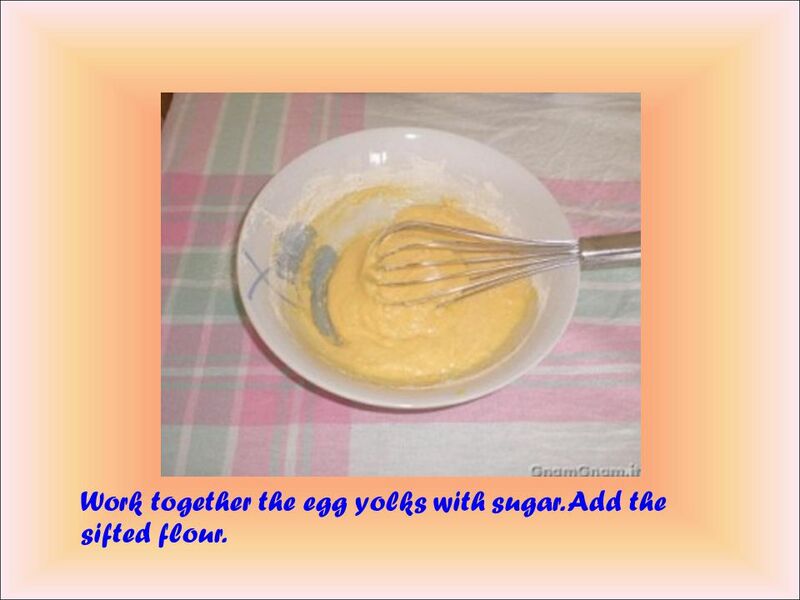 67 Work together the egg yolks with sugar. 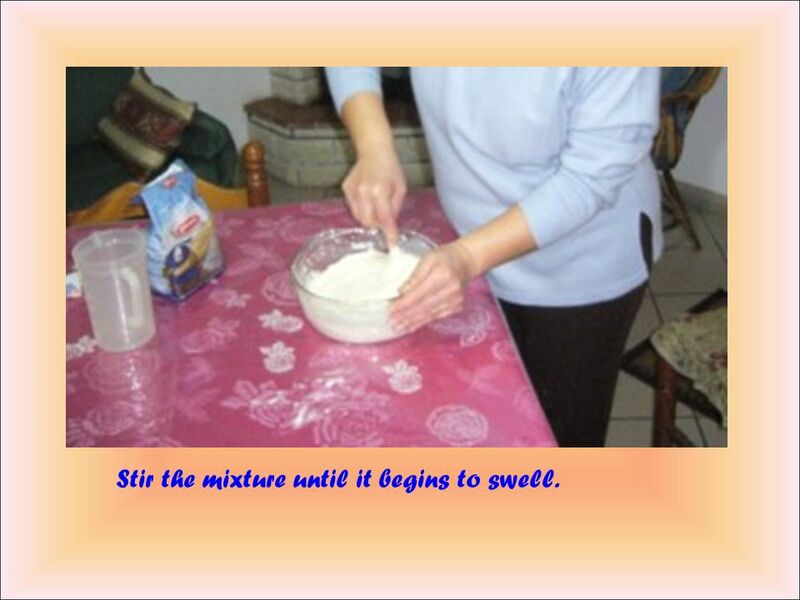 Add the sifted flour. 68 Add milk (after removing the lemon rind) and cook over low heat, stirring constantly, until the cream is pretty thick. Then cool down. 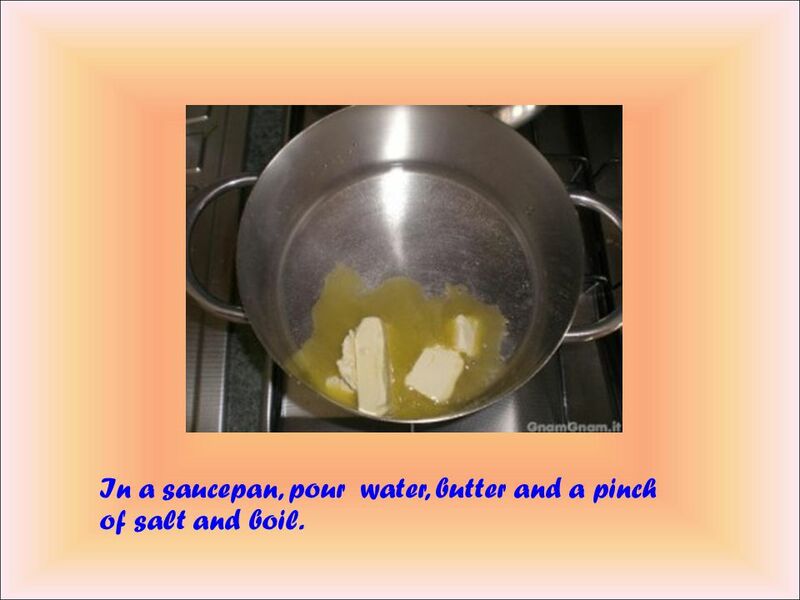 69 In a saucepan, pour water, butter and a pinch of salt and boil. 70 Add flour all at once and stir to mix well. 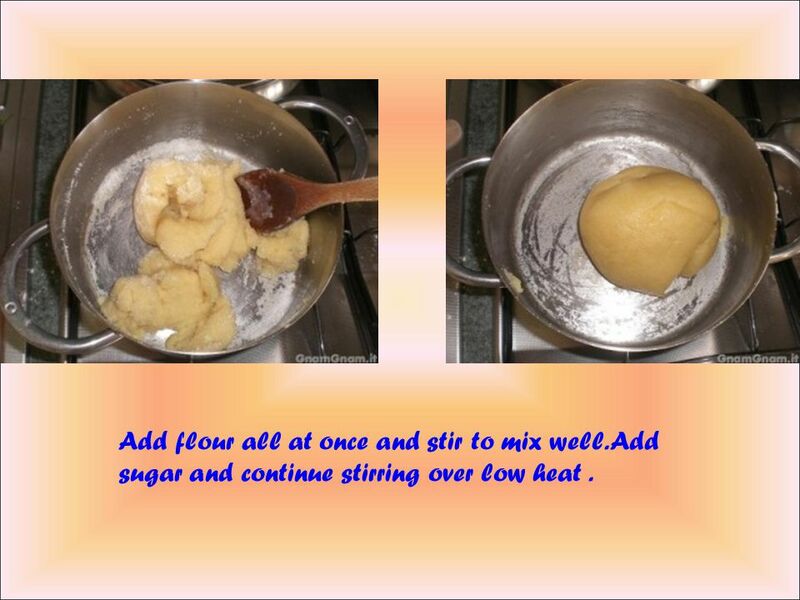 Add sugar and continue stirring over low heat. 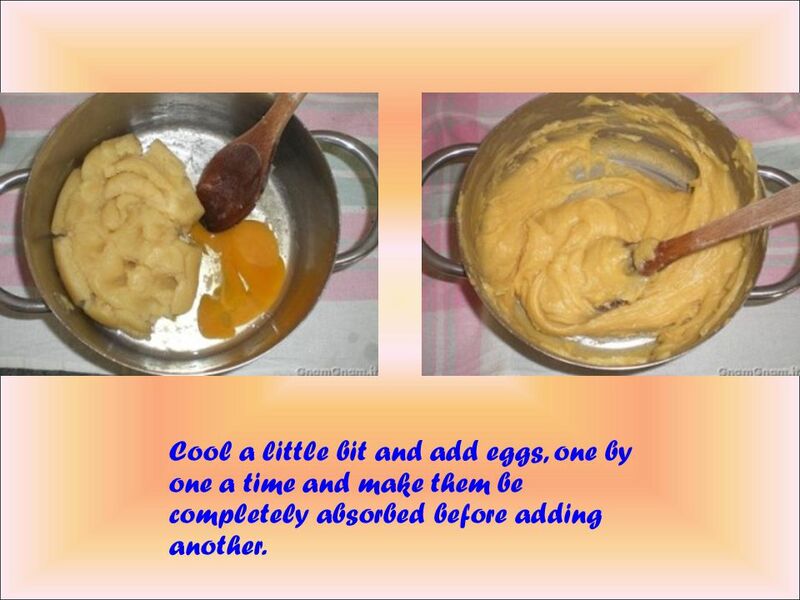 71 Cool a little bit and add eggs, one by one a time and make them be completely absorbed before adding another. 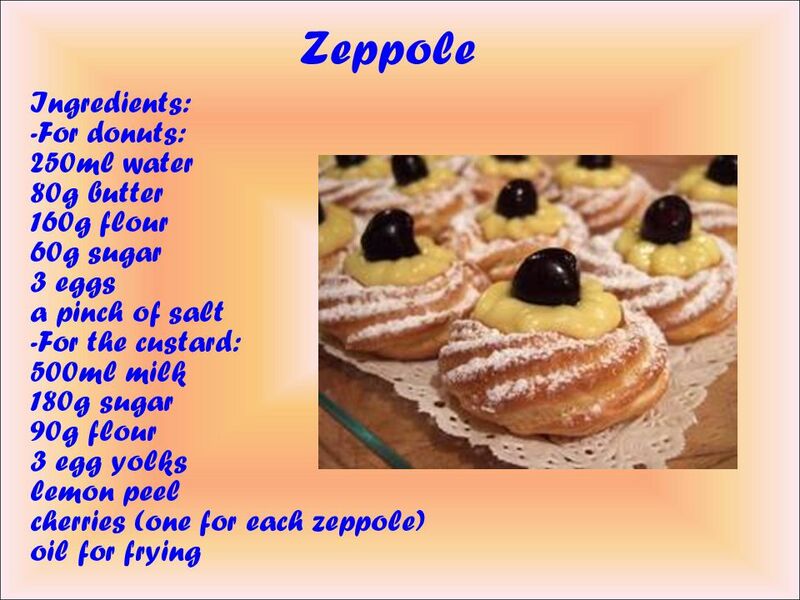 74 Heat oil and dip the ”zeppole”. 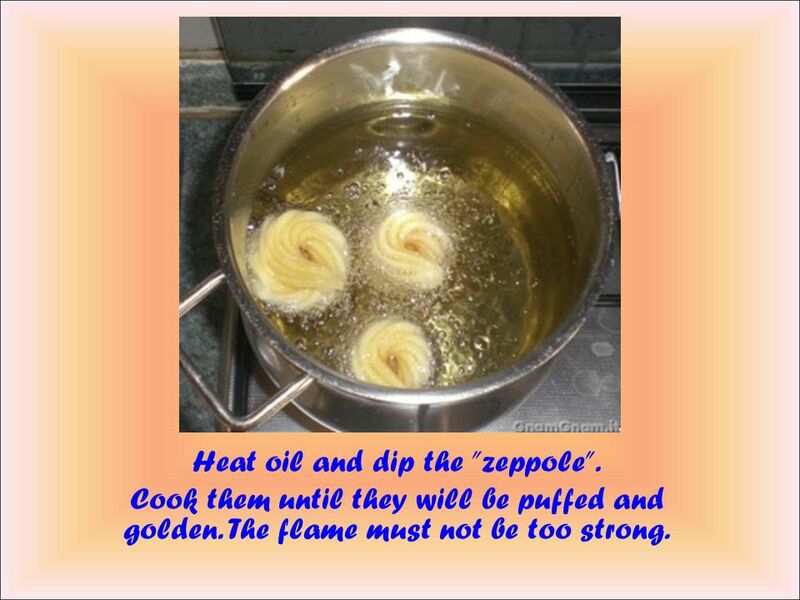 Cook them until they will be puffed and golden. The flame must not be too strong. 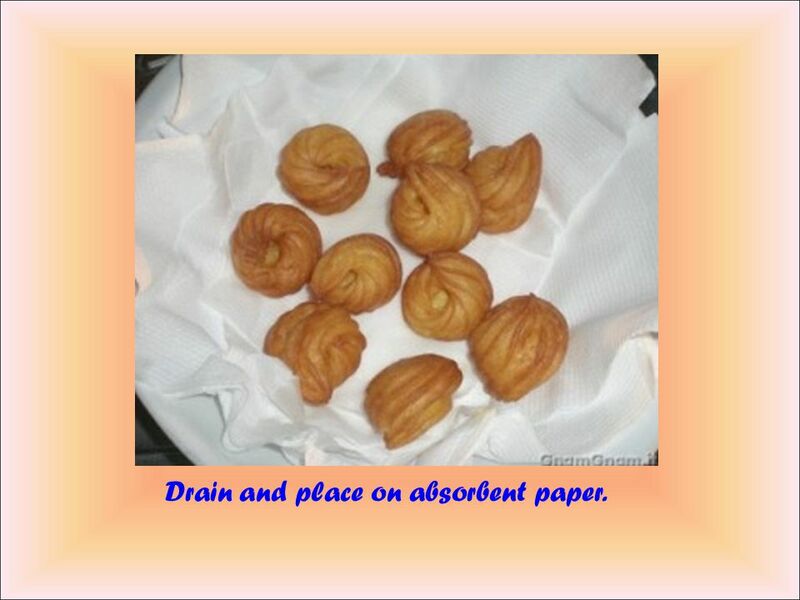 75 Drain and place on absorbent paper. 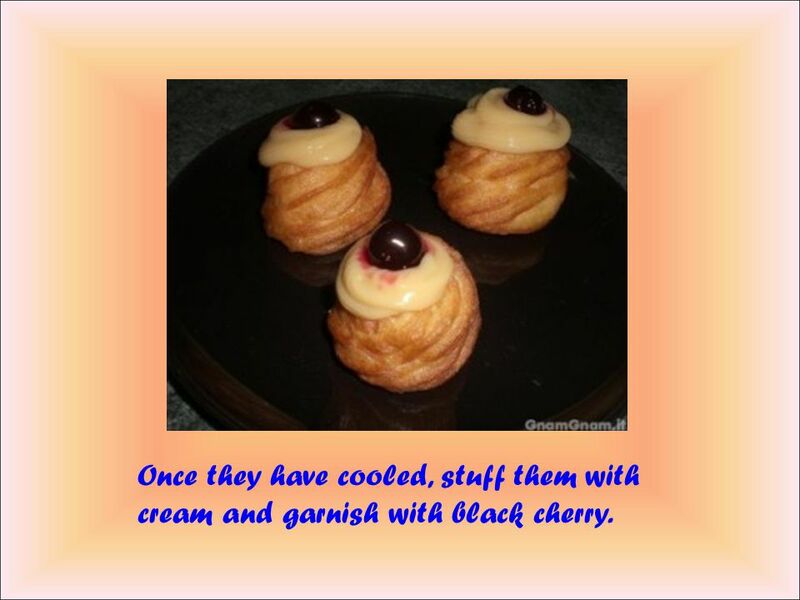 76 Once they have cooled, stuff them with cream and garnish with black cherry. 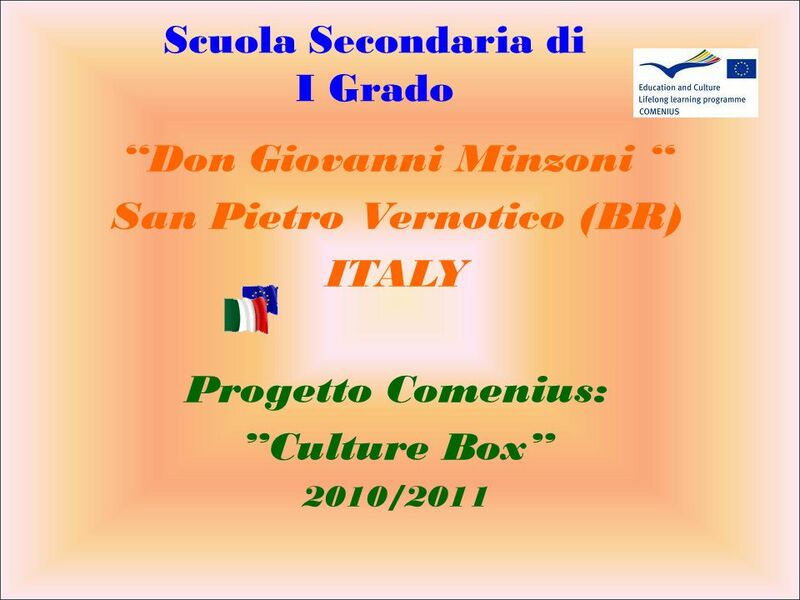 Download ppt "Scuola Secondaria di I Grado “Don Giovanni Minzoni “ San Pietro Vernotico (BR) ITALY Progetto Comenius: ”Culture Box” 2010/2011." 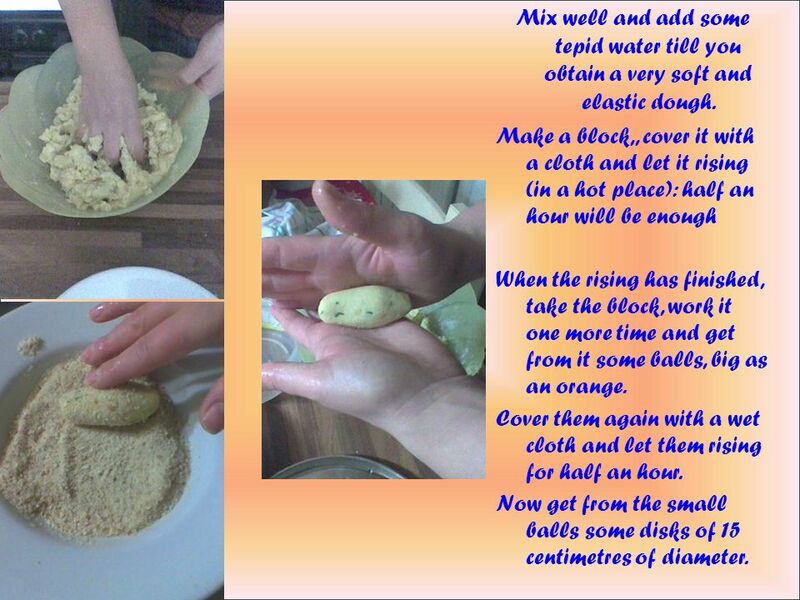 Healthy Eating Yr7 Recipes. Fruit Salad Ingredients 1 apple 1 orange ½ pineapple ring 100ml fruit juice Method 1.Pour the fruit juice into a small bowl. Wishing you a Blessed, Warm and Wonderful Spirit for HAPPY EASTER 2011. 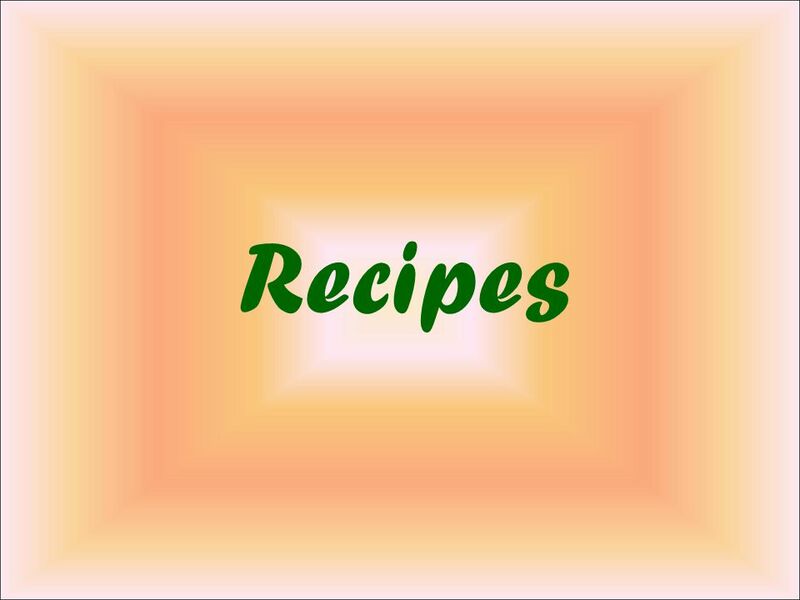 Recipes Ratio and proportion. 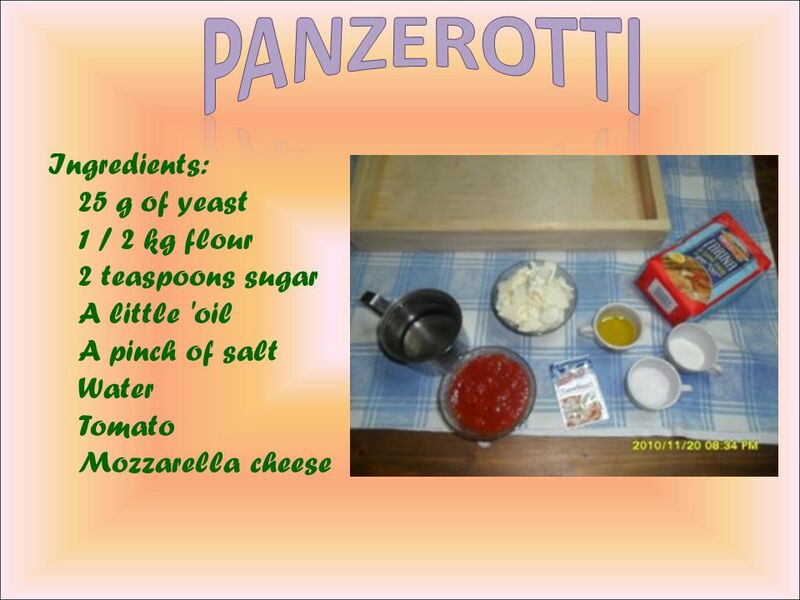 2 (8 ounce) packages cream cheese, softened 1/2 cup sugar 1 teaspoon vanilla extract 2 eggs 1 (10 inch) packaged crumb crust. THE POLISH CUISINE. Pork chop Ingredients: 4 medium-sized pork chops salt and pepper 25g plain flour 1 egg, beaten 25g breadcrumbs Oil/lard for frying. Typical dishes!. 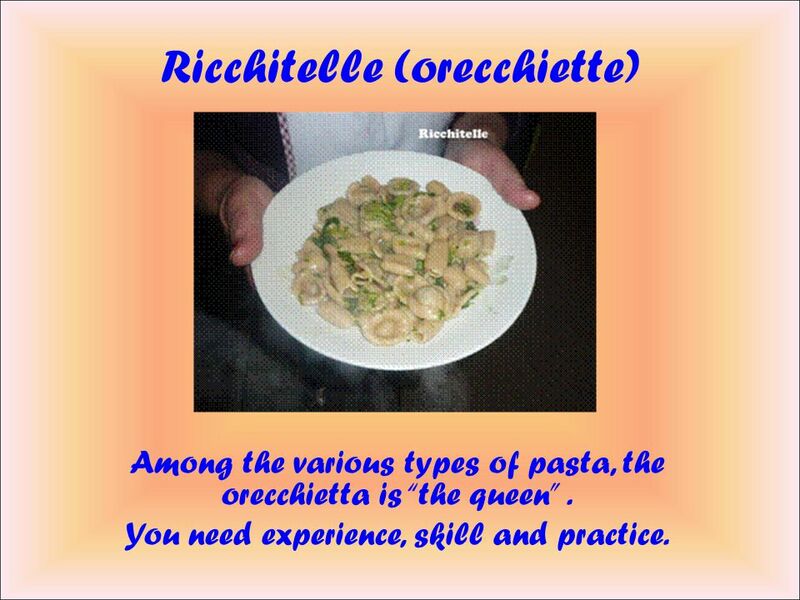 Cicatill chi rap To make the pasta(cavatelli) : flour, eggs, water. Dressing: In a frying pan stir- fry bacon bits with olive oil and. SHARING IS LEARNING Gimnazjum in Zalesie Górne October 2012. Cakes and sweets. Ingredients: All purpose flour- 1¾ cup Baking soda- 1 tsp Sugar- 1 cup Walnut- ½ cup Egg white- of two eggs Vanilla extract- ½ tsp Vegetable. 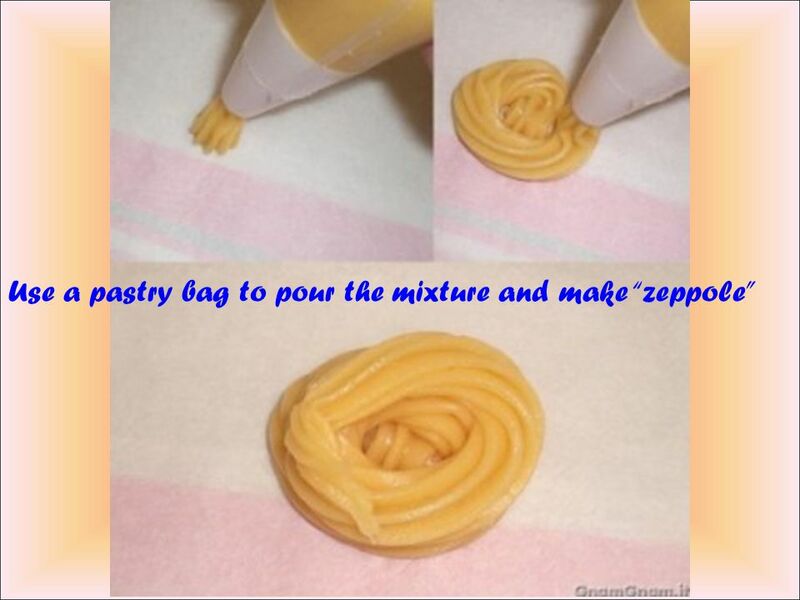 Practical Lessons 1. 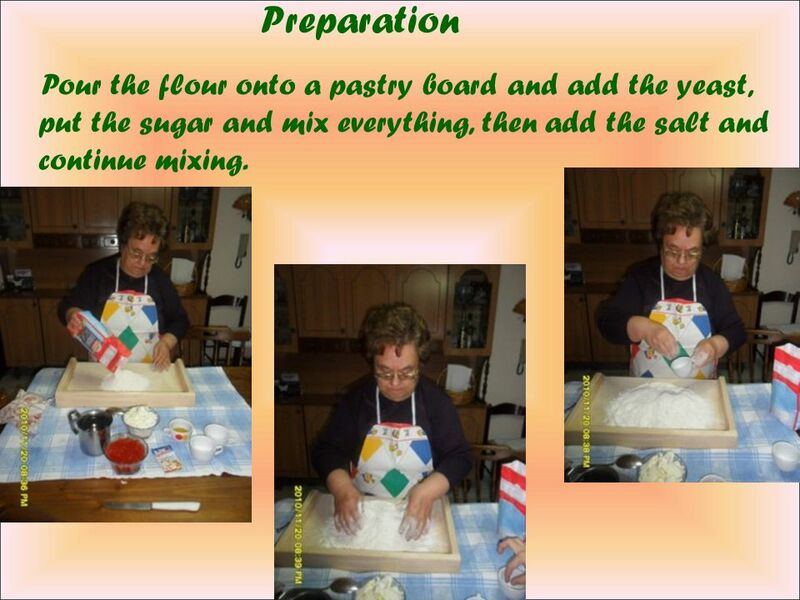 Give the ingredients list to your parent or carer in plenty of time before the lesson. 2. 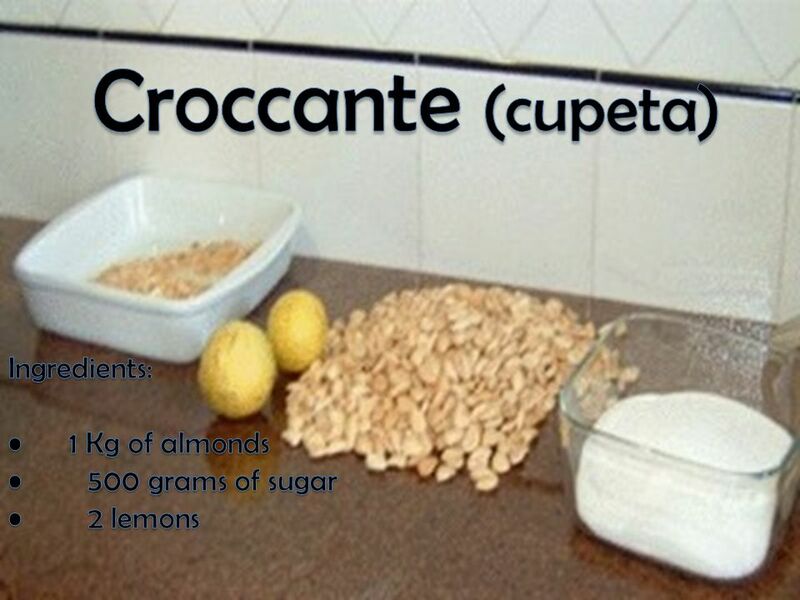 Weigh out the ingredients at home as time. Slovak traditional meals. Halušky (maybe dumplings) Ingredients: 2-3 Potatoes Flour 4-5 tbsp Salt 1 egg Instructions: Peel potatoes and finely shred them. Let’s Make PIZZA. What to do on a nice weekend?? 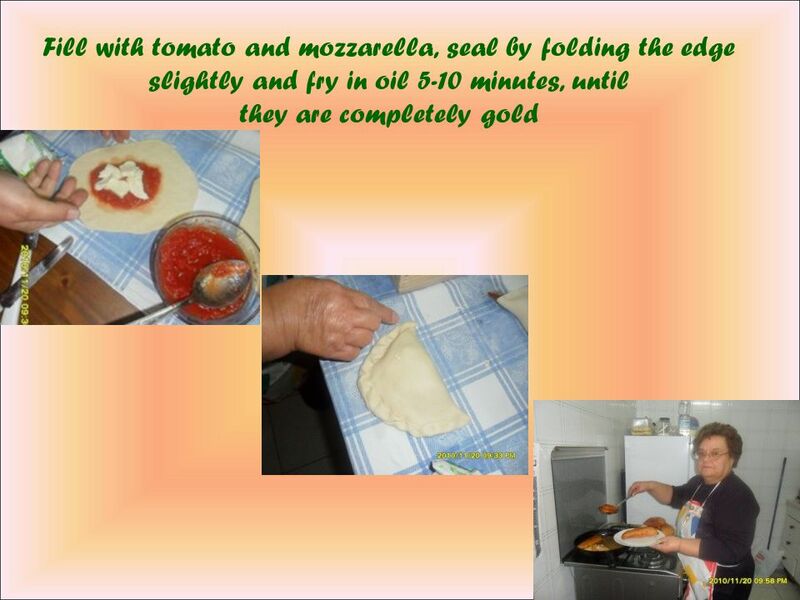 Try some new activity with family in the back yard bake delicious pizza sounds so great. Let’s gather.  -400gr of mock angulas.  -5 cloves garlic.  -1 chili pepper.  -Olive oil. Sammy will love this food! 2 main dishes and 2 desserts from Belgium! TURKISH DISHES. Yoghurt soup  Yoghurt soup (For 4-6 people)  Ingredients:  1 cup of rice  1 spoonful of flour  ½ kg yoghurt  1 spoonful of butter. Julia Szych. How to make Cabbage and mushrooms dumplings. BREAKFAST Scrambled Eggs. A roll with butter and ham. Cocoa. II BREAKFAST Bread with butter and cheese. Juice. DINNER Tomato soup. Fish. Salad. Rice.